In one of those horrific accidents of war, when he was patrolling in no man’s land near the village of Ayette, he was shot by a sentry from his own Company. He was the son of Archer Charles and Emily Pearce of Blunsdon Wiltshire England and was a Painter employed by the Great Western Railway Company at Swindon. 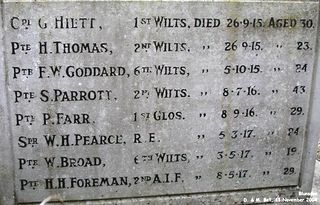 William's name is recorded on GWR memorials and on the War Memorial at Blundsdon in Wiltshire (left photo courtesy of D. & M. Ball). United Kingdom Corporal 217 London Regiment (London Rifle Brigade) 06/02/1917 Age: 20 IV. H. 8. United Kingdom Rifleman 551950 London Regiment (Queen's Westminster Rifles) 15/04/1917 Age: 20 VII. G. 4. United Kingdom Private 306168 Sherwood Foresters (Notts and Derby Regiment) 17/02/1917 Age: 23 V. A. 9. United Kingdom Private 52462 The King's (Liverpool Regiment) 21/02/1917 VI. A. 11. United Kingdom Private 38854 Yorkshire Regiment 22/02/1917 VI. A. 10. United Kingdom Private 43125 Manchester Regiment 21/04/1917 Age: 21 X. B. 5. United Kingdom Rifleman 452169 London Regiment (Finsbury Rifles) 13/03/1917 Age: 19 V. D. 6. United Kingdom Private 241111 Sherwood Foresters (Notts and Derby Regiment) 10/03/1917 VI. C. 9. United Kingdom Private 21736 The King's (Liverpool Regiment) 24/11/1916 Age: 24 III. G. 9. United Kingdom Private 2241 Manchester Regiment 02/04/1917 Age: 23 VI. G. 8. United Kingdom Private 7000 West Yorkshire Regiment (Prince of Wales's Own) 09/01/1917 Age: 26 III. J. 7. United Kingdom Gunner 14701 Royal Field Artillery 10/10/1916 Age: 22 IV. F. 16. United Kingdom Serjeant 15954 East Yorkshire Regiment 14/04/1917 VII. G. 7. United Kingdom Private 32149 King's Shropshire Light Infantry 14/04/1917 Age: 29 VII. F. 10. United Kingdom Gunner 340114 Royal Garrison Artillery 04/03/1917 Age: 26 V. C. 10. United Kingdom Corporal 252051 London Regiment (Royal Fusiliers) 11/04/1917 Age: 19 VII. D. 7. United Kingdom Lieutenant Scots Guards 08/05/1918 Age: 20 XII. B. 5. United Kingdom Private 49090 The King's (Liverpool Regiment) 30/11/1916 Age: 19 III. G. 3. United Kingdom Private 39425 Durham Light Infantry 11/04/1917 Age: 21 VIII. D. 10. United Kingdom Private 18240 The King's (Liverpool Regiment) 29/03/1917 V. F. 8. United Kingdom Private 3683 Sherwood Foresters (Notts and Derby Regiment) 23/08/1916 Age: 30 III. A. 10. United Kingdom Private 42256 Yorkshire Regiment 21/02/1917 Age: 23 VI. A. 13. United Kingdom Corporal 12071 Royal Scots 10/04/1917 VIII. A. 3. United Kingdom Private 4751 South Staffordshire Regiment 18/08/1916 Age: 29 III. A. 13. United Kingdom Private 22310 The King's (Liverpool Regiment) 12/04/1917 VIII. B. 5. United Kingdom Lance Corporal R/10751 King's Royal Rifle Corps 11/04/1917 Age: 25 VIII. F. 10. United Kingdom Private 22330 Machine Gun Corps (Infantry) 02/12/1916 Age: 26 III. H. 14. United Kingdom Serjeant 240112 Middlesex Regiment 11/04/1917 VIII. D. 4. United Kingdom Captain Royal Berkshire Regiment 01/06/1918 Age: 21 XI. C. 19. United Kingdom Rifleman 1215 King's Royal Rifle Corps 13/04/1917 Age: 37 VIII. F. 4. United Kingdom Second Lieutenant Royal Berkshire Regiment 05/06/1918 Age: 24 XI. C. 14. United Kingdom Private 281699 London Regiment (Royal Fusiliers) 18/04/1917 VII. J. 9. United Kingdom Private 7610 Oxford and Bucks Light Infantry 16/11/1916 III. E. 5. United Kingdom Private 3437 Sherwood Foresters (Notts and Derby Regiment) 24/09/1916 Age: 22 II. G. 10. United Kingdom Corporal 41176 Royal Engineers 08/04/1917 Age: 23 VI. J. 9. United Kingdom Private 201741 North Staffordshire Regiment 05/03/1917 Age: 27 VI. B. 12. United Kingdom Private 31082 Royal Scots 13/04/1917 Age: 30 VII. D. 14. United Kingdom Rifleman 302877 London Regiment (London Rifle Brigade) 16/04/1917 Age: 37 VII. H. 14. United Kingdom Rifleman 474335 London Regiment (The Rangers) 18/04/1917 VII. J. 7. United Kingdom Rifleman R/11860 King's Royal Rifle Corps 13/04/1917 Age: 20 VII. C. 11. United Kingdom Private 47212 Machine Gun Corps (Cavalry) 10/04/1917 Age: 20 VII. C. 1. United Kingdom Private G/36575 The Queen's (Royal West Surrey Regiment) 14/03/1917 Age: 32 VI. D. 5. United Kingdom Private 283487 London Regiment (Royal Fusiliers) 17/04/1917 VIII. J. 9. United Kingdom Corporal 8055 Royal Fusiliers 19/04/1917 Age: 33 VIII. J. 4. United Kingdom Gunner 37807 Royal Field Artillery 08/04/1917 Age: 23 VI. J. 4. United Kingdom Second Lieutenant Sherwood Foresters (Notts and Derby Regiment) 28/12/1916 Age: 25 III. J. 2. United Kingdom Rifleman 2738 London Regiment (Queen Victoria's Rifles) 04/07/1916 Age: 22 I. G. 14. United Kingdom Private 12494 Wiltshire Regiment 12/04/1917 Age: 18 VIII. C. 6. United Kingdom Corporal 120664 Royal Engineers 28/06/1916 Age: 19 I. D. 1. United Kingdom Rifleman A/201060 King's Royal Rifle Corps 16/05/1917 Age: 38 X. H. 13. United Kingdom Private 9568 Bedfordshire Regiment 01/05/1917 X. E. 5. United Kingdom Private 202946 Middlesex Regiment 13/04/1917 Age: 23 VII. E. 6. United Kingdom Serjeant 46637 Royal Field Artillery 24/03/1917 Age: 23 VI. E. 6. United Kingdom Private 4653 King's Own Yorkshire Light Infantry 04/12/1916 Age: 21 IV. D. 6. United Kingdom Private 204056 London Regiment (Royal Fusiliers) 14/04/1917 VIII. D. 11. United Kingdom Rifleman 392875 London Regiment (Queen Victoria's Rifles) 17/04/1917 VIII. J. 2. United Kingdom Rifleman 4232 London Regiment (The Rangers) 02/07/1916 Age: 19 II. D. 7. United Kingdom Bombardier 93406 Royal Garrison Artillery 10/04/1917 Age: 30 VII. A. 7. United Kingdom Rifleman 552639 London Regiment (Queen's Westminster Rifles) 08/04/1917 Age: 25 VI. J. 8. United Kingdom Private 300156 Durham Light Infantry 29/04/1917 Age: 25 IX. D. 9. United Kingdom Private 81808 Machine Gun Corps (Infantry) 25/04/1917 Age: 22 IX. D. 1. United Kingdom Second Lieutenant East Yorkshire Regiment 14/11/1916 Age: 30 II. J. 8. United Kingdom Lance Corporal 2180 Sherwood Foresters (Notts and Derby Regiment) 20/07/1916 Age: 21 I. H. 6. United Kingdom Company Serjeant Major 9714 King's Shropshire Light Infantry 10/04/1917 VII. E. 15. United Kingdom Rifleman 552657 London Regiment (Queen's Westminster Rifles) 26/04/1917 Age: 24 IX. C. 7. United Kingdom Private 43514 King's Own Yorkshire Light Infantry 05/05/1917 IX. G. 8. United Kingdom Private 513074 London Regiment (London Scottish) 02/04/1917 V. G. 8. United Kingdom Private 200612 Durham Light Infantry 27/04/1917 IX. E. 14. United Kingdom Private 5094 Leicestershire Regiment 07/10/1916 Age: 18 II. H. 4. United Kingdom Gunner 91672 Royal Garrison Artillery 05/04/1917 Age: 33 VI. H. 1. United Kingdom Lance Corporal 2656 South Staffordshire Regiment 21/12/1916 IV. E. 4. United Kingdom Second Lieutenant Royal Berkshire Regiment 05/06/1918 Age: 35 XI. C. 13. United Kingdom Rifleman 553482 London Regiment (Queen's Westminster Rifles) 09/04/1917 Age: 27 VI. H. 14. United Kingdom Lieutenant Colonel London Regiment (Queen Victoria's Rifles) 24/03/1917 Age: 48 VI. E. 9. United Kingdom Private 242290 Middlesex Regiment 13/04/1917 VII. E. 9. United Kingdom Rifleman 5/9494 Rifle Brigade 15/04/1917 Age: 22 VIII. G. 14. United Kingdom Private 32/435 Northumberland Fusiliers 17/04/1917 Age: 27 X. A. 5. United Kingdom Private 43115 Manchester Regiment 25/04/1917 Age: 25 IX. C. 2. United Kingdom Private 242448 Sherwood Foresters (Notts and Derby Regiment) 11/03/1917 VI. C. 14. United Kingdom Private 55174 Royal Welsh Fusiliers 29/04/1917 IX. D. 12. United Kingdom Private 13938 Lincolnshire Regiment 02/04/1917 V. G. 11. United Kingdom Private 325791 Durham Light Infantry 14/04/1917 Age: 24 VII. F. 2. United Kingdom Private 31148 East Yorkshire Regiment 11/04/1917 VII. C. 5. United Kingdom Private 491862 London Regiment 15/04/1917 VIII. G. 10. United Kingdom Lance Corporal 5938 West Yorkshire Regiment (Prince of Wales's Own) 11/01/1917 XII. C. 12. United Kingdom Corporal 32147 Royal Garrison Artillery 12/11/1916 Age: 26 II. J. 3. United Kingdom Lance Corporal 22962 Wiltshire Regiment 11/04/1917 Age: 27 VII. E. 2. United Kingdom Private 202577 North Staffordshire Regiment 20/03/1917 V. E. 6. United Kingdom Private 291866 Northumberland Fusiliers 19/04/1917 Age: 38 VIII. J. 10. United Kingdom Corporal 2426 York and Lancaster Regiment 24/10/1916 Age: 33 III. C. 8. United Kingdom Private 12687 York and Lancaster Regiment 02/04/1917 VI. G. 4. United Kingdom Private 202169 Suffolk Regiment 15/04/1917 VII. G. 2. United Kingdom Driver 17601 Royal Field Artillery 01/11/1916 IV. A. 8. United Kingdom Private 242259 Northumberland Fusiliers 22/04/1917 Age: 23 IX. A. 3. United Kingdom Private 18/332 Northumberland Fusiliers 15/07/1916 Age: 23 II. E. 9. United Kingdom Private 18500 Wiltshire Regiment 10/04/1917 Age: 23 VIII. B. 3. United Kingdom Private 51586 The King's (Liverpool Regiment) 09/12/1916 III. H. 12. United Kingdom Private 36644 Northamptonshire Regiment 21/04/1918 Age: 22 II. E. 15. 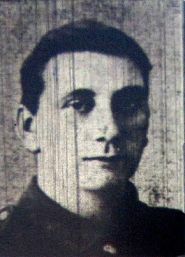 United Kingdom Private 4831 London Regiment (Royal Fusiliers) 31/07/1916 Age: 27 I. J. 10. United Kingdom Private 5595 Sherwood Foresters (Notts and Derby Regiment) 03/07/1916 I. F. 7. United Kingdom Gunner 776520 Royal Field Artillery 16/12/1916 IV. B. 15. United Kingdom Private 51601 The King's (Liverpool Regiment) 11/04/1917 VIII. C. 8. United Kingdom Private 513114 London Regiment (London Scottish) 29/03/1917 Age: 20 VI. F. 1. United Kingdom Private 3403 Argyll and Sutherland Highlanders 26/04/1917 IX. D. 2. 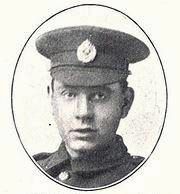 United Kingdom Lance Corporal 321150 London Regiment (City of London Rifles) 30/03/1917 Age: 19 VI. F. 2. United Kingdom Rifleman 4368 West Yorkshire Regiment (Prince of Wales's Own) 10/02/1917 IV. H. 14. United Kingdom Lieutenant North Staffordshire Regiment 02/07/1916 Age: 29 I. E. 1. United Kingdom Private 240279 Border Regiment 29/04/1917 IX. D. 13. United Kingdom Lance Corporal 9758 Cameronians (Scottish Rifles) 21/05/1917 XII. A. 7. United Kingdom Private 12026 Lancashire Fusiliers 25/11/1916 Age: 23 IV. D. 2. United Kingdom Private 202468 London Regiment (Royal Fusiliers) 14/03/1917 Age: 21 V. D. 14. United Kingdom Private 6149 York and Lancaster Regiment 11/11/1916 III. D. 7. United Kingdom Private 493565 London Regiment 10/04/1917 VIII. B. 10. United Kingdom Private 16573 Machine Gun Corps (Infantry) 17/05/1917 Age: 32 XI. A. 8. United Kingdom Rifleman 392656 London Regiment (Queen Victoria's Rifles) 15/04/1917 Age: 26 VII. G. 10. United Kingdom Private 3061 South Staffordshire Regiment 24/06/1916 Age: 20 XII. C. 2. United Kingdom Private 57693 The King's (Liverpool Regiment) 13/04/1917 Age: 29 VII. E. 3. United Kingdom Private 60133 Devonshire Regiment 17/05/1917 Age: 24 XI. A. 5. United Kingdom Private 24829 Queen's Own (Royal West Kent Regiment) 09/05/1917 Age: 29 IX. H. 10. United Kingdom Private 4496 North Staffordshire Regiment 06/10/1916 Age: 30 II. H. 3. United Kingdom Corporal 53439 Durham Light Infantry 14/04/1917 Age: 23 VII. G. 1. United Kingdom Bombardier 833 Royal Field Artillery 13/10/1916 II. H. 7. United Kingdom Corporal 46685 Royal Flying Corps 13/07/1917 Age: 24 IX. H. 15. United Kingdom Corporal 3333 Leicestershire Regiment 04/02/1917 IV. H. 4. United Kingdom Rifleman 323597 London Regiment (City of London Rifles) 07/03/1917 Age: 31 V. C. 6. United Kingdom Private 5873 King's Own Yorkshire Light Infantry 09/02/1917 Age: 20 IV. H. 12. United Kingdom Second Lieutenant King's Own Yorkshire Light Infantry 01/05/1917 Age: 19 X. E. 9. United Kingdom Private 2162 Duke of Wellington's (West Riding Regiment) 17/11/1916 IV. A. 15. United Kingdom Private 4803 Lincolnshire Regiment 26/06/1916 Age: 21 II. D. 15. United Kingdom Private 300199 Manchester Regiment 03/06/1918 Age: 22 XI. C. 15. United Kingdom Private 11719 Duke of Cornwall's Light Infantry 13/05/1917 Age: 23 X. H. 12. United Kingdom Rifleman 393230 London Regiment (Queen Victoria's Rifles) 15/04/1917 Age: 32 VII. G. 5. United Kingdom Private 6049 West Yorkshire Regiment (Prince of Wales's Own) 12/01/1917 Age: 35 IV. F. 6. United Kingdom Rifleman 552696 London Regiment (Queen's Westminster Rifles) 16/04/1917 VIII. J. 1. United Kingdom Private 818 East Yorkshire Regiment 22/11/1916 Age: 32 III. F. 3. United Kingdom Driver 10402 Royal Field Artillery 09/02/1917 IV. J. 1. United Kingdom Private 202013 North Staffordshire Regiment 17/03/1917 VI. D. 6. United Kingdom Corporal 8878 South Staffordshire Regiment 05/07/1916 Age: 25 I. G. 7. United Kingdom Second Lieutenant Duke of Wellington's (West Riding Regiment) 16/01/1917 Age: 24 III. J. 11. United Kingdom Private 2559 Leicestershire Regiment 09/08/1917 II. F. 4. United Kingdom Private 8827 Bedfordshire Regiment 13/04/1917 Age: 32 VIII. E. 7. United Kingdom Rifleman 323613 London Regiment (City of London Rifles) 09/03/1917 Age: 19 VI. C. 7. United Kingdom Private 3776 London Regiment (Royal Fusiliers) 04/07/1916 II. E. 1. United Kingdom Private 1942 South Irish Horse 29/03/1917 Age: 27 VI. F. 3. United Kingdom Lance Serjeant 251621 London Regiment (Royal Fusiliers) 03/04/1917 V. G. 13. United Kingdom Private 302895 Durham Light Infantry 27/04/1917 IX. E. 5. United Kingdom Private 48343 The King's (Liverpool Regiment) 11/04/1917 Age: 20 VIII. E. 12. United Kingdom Private 3/7179 Bedfordshire Regiment 04/11/1916 Age: 22 III. D. 11. United Kingdom Lance Corporal 473738 London Regiment (The Rangers) 11/04/1917 Age: 27 VIII. A. 7. United Kingdom Private 14347 The King's (Liverpool Regiment) 05/04/1917 Age: 35 VI. H. 8. United Kingdom Private 204199 London Regiment (Royal Fusiliers) 21/03/1917 Age: 19 V. E. 7. United Kingdom Captain King's Shropshire Light Infantry 11/04/1917 Age: 28 VII. C. 6. United Kingdom Private MS/144 Army Service Corps 27/05/1918 Age: 27 XII. B. 14. United Kingdom Second Lieutenant Royal Flying Corps 07/04/1917 V. J. 5. United Kingdom Lieutenant Colonel North Staffordshire Regiment 03/07/1916 Age: 36 I. F. 5. United Kingdom Private 17518 Oxford and Bucks Light Infantry 27/04/1917 Age: 32 IX. E. 6. United Kingdom Gunner 85639 Royal Field Artillery 07/10/1916 Age: 27 III. B. 5. United Kingdom Private 21788 South Lancashire Regiment 26/01/1917 IV. G. 3. United Kingdom Private 32706 Durham Light Infantry 23/04/1917 IX. B. 1. United Kingdom Private 2953 Sherwood Foresters (Notts and Derby Regiment) 11/10/1916 Age: 19 II. H. 6. United Kingdom Private 492146 London Regiment 10/04/1917 VIII. B. 11. United Kingdom Gunner 962 Royal Field Artillery 15/10/1916 Age: 24 III. B. 12. United Kingdom Private 1681 Sherwood Foresters (Notts and Derby Regiment) 03/07/1916 VI. B. 15. United Kingdom Corporal 2321 Middlesex Regiment 30/09/1916 II. H. 1. United Kingdom Gunner 69703 Royal Garrison Artillery 03/01/1917 Age: 28 IV. F. 3. United Kingdom Rifleman R/14228 King's Royal Rifle Corps 13/04/1917 VII. D. 9. United Kingdom Lance Corporal 9222 Manchester Regiment 14/12/1916 III. H. 7. United Kingdom Private 3387 Argyll and Sutherland Highlanders 02/05/1917 X. G. 10. United Kingdom Private 58003 The King's (Liverpool Regiment) 11/04/1917 Age: 19 VIII. A. 8. United Kingdom Second Lieutenant Royal Flying Corps 02/04/1917 Age: 27 V. G. 6. United Kingdom Private 3859 Sherwood Foresters (Notts and Derby Regiment) 28/06/1916 Age: 18 I. E. 14. United Kingdom Private 17558 King's Shropshire Light Infantry 20/04/1917 Age: 28 X. B. 10. United Kingdom Rifleman S/26148 Rifle Brigade 13/04/1917 Age: 29 VII. F. 9. United Kingdom Shoeing Smith 79839 Royal Field Artillery 01/04/1917 Age: 31 V. G. 1. United Kingdom Rifleman S/5058 Rifle Brigade 13/04/1917 VIII. E. 5. United Kingdom Rifleman 471558 London Regiment (The Rangers) 18/04/1917 Age: 21 VII. G. 16. United Kingdom Rifleman 4471 London Regiment (Queen's Westminster Rifles) 18/07/1916 Age: 22 I. H. 8. United Kingdom Private 18767 The Loyal North Lancashire Regiment 03/07/1916 Age: 20 I. E. 3. United Kingdom Driver 827 Royal Field Artillery 19/09/1916 II. G. 8. United Kingdom Private 53191 Royal Fusiliers 17/04/1917 VIII. H. 7. United Kingdom Private 4505 Sherwood Foresters (Notts and Derby Regiment) 22/07/1916 I. H. 1. United Kingdom Private 332407 Highland Light Infantry 22/05/1917 Age: 23 XII. A. 6. United Kingdom Private 200511 Durham Light Infantry 26/04/1917 Age: 19 IX. C. 10. United Kingdom Rifleman R/33618 King's Royal Rifle Corps 30/03/1917 V. F. 13. United Kingdom Private 26937 Wiltshire Regiment 21/11/1916 Age: 36 IV. C. 10. United Kingdom Private 2131 Middlesex Regiment 18/07/1916 Age: 21 I. H. 7. United Kingdom Private 265767 Northumberland Fusiliers 19/04/1917 VIII. J. 5. United Kingdom Second Lieutenant Scots Guards 20/05/1918 Age: 20 XII. B. 9. United Kingdom Rifleman A/211 King's Royal Rifle Corps 18/05/1917 Age: 32 XI. A. 11. United Kingdom Private 16495 Lincolnshire Regiment 14/04/1917 VIII. G. 2. United Kingdom Private 4216 Sherwood Foresters (Notts and Derby Regiment) 23/01/1917 Age: 22 IV. G. 2. United Kingdom Private 6429 Middlesex Regiment 13/07/1916 XII. C. 6. United Kingdom Rifleman 472773 London Regiment (The Rangers) 12/04/1917 Age: 22 VII. E. 8. United Kingdom Serjeant 391118 London Regiment (Queen Victoria's Rifles) 22/03/1917 Age: 24 V. E. 10. United Kingdom Private 12534 Durham Light Infantry 10/04/1917 VII. A. 11. United Kingdom Corporal 250618 Durham Light Infantry 15/04/1917 Age: 22 VII. H. 2. United Kingdom Rifleman R/24173 King's Royal Rifle Corps 12/04/1917 Age: 29 VIII. B. 13. United Kingdom Private 232159 London Regiment (Royal Fusiliers) 23/03/1917 V. E. 11. United Kingdom Private 4331 Northumberland Fusiliers 03/09/1916 III. A. 5. United Kingdom Corporal 18112 Wiltshire Regiment 11/04/1917 Age: 33 VIII. C. 11. United Kingdom Rifleman 392675 London Regiment (Queen Victoria's Rifles) 17/04/1917 Age: 19 VII. G. 14. United Kingdom Corporal 24421 The Queen's (Royal West Surrey Regiment) 22/05/1917 Age: 19 XII. A. 11. United Kingdom Private 18461 Oxford and Bucks Light Infantry 13/04/1917 Age: 37 VIII. C. 13. United Kingdom Serjeant 42976 King's Own Yorkshire Light Infantry 10/04/1917 Age: 21 VII. A. 13. United Kingdom Private 269759 Sherwood Foresters (Notts and Derby Regiment) 12/03/1917 Age: 30 V. D. 7. United Kingdom Rifleman 321960 London Regiment (City of London Rifles) 10/02/1917 IV. J. 2. United Kingdom Private 30122 Yorkshire Regiment 13/11/1916 III. D. 2. United Kingdom Rifleman S/17381 Rifle Brigade 29/04/1917 Age: 24 IX. F. 2. United Kingdom Private 3404 London Regiment 04/07/1916 Age: 19 II. D. 14. United Kingdom Private 242581 Leicestershire Regiment 18/03/1917 Age: 19 VI. D. 10. United Kingdom Private 200236 Sherwood Foresters (Notts and Derby Regiment) 17/02/1917 V. A. 14. United Kingdom Private 58648 The King's (Liverpool Regiment) 11/04/1917 VIII. C. 9. United Kingdom Private 240955 Cameronians (Scottish Rifles) 18/04/1917 Age: 21 VII. J. 3. United Kingdom Rifleman 6090 West Yorkshire Regiment (Prince of Wales's Own) 17/11/1916 Age: 32 IV. A. 16. United Kingdom Rifleman R/30127 King's Royal Rifle Corps 29/04/1917 IX. F. 1. United Kingdom Private 6843 South Staffordshire Regiment 16/12/1916 Age: 27 IV. D. 14. United Kingdom Gunner 604172 Royal Horse Artillery 09/04/1917 Age: 26 VI. J. 11. United Kingdom Serjeant 18409 Durham Light Infantry 22/04/1917 IX. B. 3. United Kingdom Lance Corporal 103854 Royal Engineers 29/03/1917 V. F. 9. United Kingdom Serjeant 281877 London Regiment (Royal Fusiliers) 19/04/1917 Age: 33 VIII. J. 6. United Kingdom Private 48009 Manchester Regiment 29/04/1917 IX. F. 3. United Kingdom Private G/5693 Royal Sussex Regiment 13/05/1917 XII. A. 1. United Kingdom Private 57599 The King's (Liverpool Regiment) 11/04/1917 VII. B. 12. United Kingdom Second Lieutenant Royal Flying Corps 04/12/1917 Age: 21 XI. B. 12. United Kingdom Lance Corporal 2385 Sherwood Foresters (Notts and Derby Regiment) 04/07/1916 Age: 25 I. G. 10. United Kingdom Rifleman 391330 London Regiment (Queen Victoria's Rifles) 01/03/1917 Age: 20 V. B. 1. United Kingdom Rifleman B/203692 Rifle Brigade 12/02/1917 Age: 23 IV. J. 4. United Kingdom Private 240502 South Staffordshire Regiment 09/02/1917 Age: 20 IV. H. 11. United Kingdom Corporal 28026 East Yorkshire Regiment 12/04/1917 Age: 28 VII. C. 10. United Kingdom Serjeant 12748 Oxford and Bucks Light Infantry 01/05/1917 Age: 31 IX. F. 11. United Kingdom Private 57700 The King's (Liverpool Regiment) 12/04/1917 Age: 20 VIII. B. 7. United Kingdom Private SE/1753 Army Veterinary Corps 27/04/1917 Age: 35 IX. D. 3. United Kingdom Lieutenant Royal Flying Corps 09/04/1917 Age: 22 VI. J. 14. United Kingdom Private 41696 Manchester Regiment 13/04/1917 Age: 40 VII. D. 2. United Kingdom Private 241509 Middlesex Regiment 13/04/1917 Age: 22 VII. C. 8. United Kingdom Private 26199 The King's (Liverpool Regiment) 24/12/1916 Age: 28 IV. E. 6. United Kingdom Private 8460 Northumberland Fusiliers 06/06/1917 Age: 41 XI. B. 5. United Kingdom Private 232677 London Regiment (Royal Fusiliers) 25/03/1917 Age: 27 VI. E. 8. United Kingdom Private 21/1040 Northumberland Fusiliers 30/03/1917 Age: 46 VI. F. 5. United Kingdom Private 43048 King's Own Yorkshire Light Infantry 01/05/1917 X. G. 6. United Kingdom Private 233138 London Regiment (Royal Fusiliers) 21/03/1917 V. E. 9. United Kingdom Pioneer 114422 Royal Engineers 27/12/1916 Age: 43 III. J. 1. United Kingdom Rifleman 552634 London Regiment (Queen's Westminster Rifles) 10/04/1917 Age: 29 VII. B. 6. United Kingdom Lance Corporal 12272 Royal Fusiliers 14/11/1916 Age: 20 III. E. 14. United Kingdom Private 9000 Highland Light Infantry 22/04/1917 Age: 20 X. B. 7. United Kingdom Driver 118075 Royal Field Artillery 18/04/1917 Age: 39 X. A. 4. United Kingdom Gunner 166229 Royal Field Artillery 08/04/1917 VI. H. 13. United Kingdom Gunner 80298 Royal Garrison Artillery 08/04/1917 Age: 21 VI. J. 10. United Kingdom Private 2974 London Regiment (Royal Fusiliers) 19/08/1916 II. F. 13. United Kingdom Private 493212 London Regiment 03/04/1917 V. H. 5. United Kingdom Rifleman 452671 London Regiment (Finsbury Rifles) 16/02/1917 Age: 34 V. A. 7. United Kingdom Corporal 16007 Norfolk Regiment 24/05/1917 Age: 36 XI. B. 2. United Kingdom Private 21354 The King's (Liverpool Regiment) 27/04/1917 Age: 27 X. D. 10. United Kingdom Private 13890 Army Cyclist Corps 05/12/1916 Age: 30 IV. D. 8. United Kingdom Private 3959 Lincolnshire Regiment 22/08/1916 Age: 18 XII. C. 15. United Kingdom Captain Durham Light Infantry 25/04/1917 Age: 20 IX. A. 15. United Kingdom Private 5152 Royal Warwickshire Regiment 14/10/1916 Age: 24 II. H. 11. United Kingdom Private 10857 East Yorkshire Regiment 14/04/1917 Age: 37 VII. G. 6. United Kingdom Corporal 34491 Manchester Regiment 26/04/1917 IX. E. 4. United Kingdom Lieutenant Border Regiment 20/04/1917 Age: 37 VIII. J. 12. United Kingdom Private 20533 Sherwood Foresters (Notts and Derby Regiment) 12/10/1916 III. B. 11. United Kingdom Private 42305 Yorkshire Regiment 03/04/1917 V. H. 2. United Kingdom Private 15779 Argyll and Sutherland Highlanders 13/05/1917 Age: 20 X. H. 11. United Kingdom Private 11084 Yorkshire Regiment 24/08/1916 II. F. 14. United Kingdom Private 202313 Cameronians (Scottish Rifles) 17/04/1917 Age: 35 VIII. H. 9. United Kingdom Private 4847 Duke of Wellington's (West Riding Regiment) 17/10/1916 Age: 26 III. C. 4. United Kingdom Gunner 41461 Royal Garrison Artillery 06/05/1917 IX. G. 4. United Kingdom Rifleman 554384 London Regiment (Queen's Westminster Rifles) 15/04/1917 VII. H. 15. United Kingdom Lance Corporal 3407 Monmouthshire Regiment 02/07/1916 Age: 26 I. F. 12. United Kingdom Gunner 820540 Royal Field Artillery 01/04/1917 Age: 24 VI. F. 12. United Kingdom Private 201766 Cameronians (Scottish Rifles) 16/04/1917 Age: 23 VII. H. 6. United Kingdom Private 42724 Durham Light Infantry 11/04/1917 Age: 23 VII. C. 15. United Kingdom Driver 79853 Royal Field Artillery 26/04/1917 IX. D. 4. United Kingdom Second Lieutenant Durham Light Infantry 24/04/1917 Age: 22 X. C. 5. United Kingdom Corporal 85981 Royal Engineers 30/04/1917 IX. F. 12. United Kingdom Private 5033 The King's (Liverpool Regiment) 17/04/1916 XI. C. 4. United Kingdom Private 17864 Royal Warwickshire Regiment 16/11/1916 III. E. 6. United Kingdom Private 41134 The King's (Liverpool Regiment) 23/04/1917 X. B. 13. United Kingdom Private 3/9272 Wiltshire Regiment 11/04/1917 Age: 27 VII. C. 3. United Kingdom Second Lieutenant Sherwood Foresters (Notts and Derby Regiment) 26/02/1917 V. B. 6. United Kingdom Private 38928 Yorkshire Regiment 03/04/1917 VI. G. 2. United Kingdom Private 34463 Duke of Cornwall's Light Infantry 10/04/1917 Age: 32 VII. B. 1. United Kingdom Private 42310 Yorkshire Regiment 23/02/1917 V. B. 11. United Kingdom Private 33192 Worcestershire Regiment 02/05/1917 X. G. 7. United Kingdom Private 202275 Suffolk Regiment 02/05/1917 X. E. 8. United Kingdom Private 23124 Middlesex Regiment 17/02/1917 V. A. 10. United Kingdom Private G/37727 The Queen's (Royal West Surrey Regiment) 06/05/1917 Age: 39 IX. G. 9. United Kingdom Private 16224 North Staffordshire Regiment 23/06/1916 I. D. 14. United Kingdom Private 20290 South Lancashire Regiment 22/03/1917 Age: 28 V. E. 12. United Kingdom Serjeant 304143 London Regiment (London Rifle Brigade) 13/04/1917 VIII. D. 5. United Kingdom Rifleman R/36223 King's Royal Rifle Corps 21/05/1917 Age: 18 XII. A. 4. United Kingdom Gunner 160181 Royal Field Artillery 08/05/1917 Age: 29 IX. H. 6. United Kingdom Driver T2/015894 Royal Army Medical Corps 25/06/1916 XI. C. 5. United Kingdom Gunner 107253 Royal Garrison Artillery 26/03/1917 Age: 37 V. F. 7. Canadian Lieutenant Canadian Infantry 23/08/1917 Age: 21 XI. A. 13. United Kingdom Private 514507 London Regiment (London Scottish) 11/04/1917 Age: 28 VIII A. 14. United Kingdom Private 5037 North Staffordshire Regiment 02/07/1916 I. E. 7. United Kingdom Private 36843 Lancashire Fusiliers 07/10/1916 Age: 22 III. B. 6. United Kingdom Private 20803 Machine Gun Corps (Infantry) 17/04/1917 Age: 29 VII. G. 12. United Kingdom Rifleman 474171 London Regiment (The Rangers) 17/04/1917 Age: 27 X. A. 3. United Kingdom Private 202937 Yorkshire Regiment 25/04/1917 Age: 19 X. D. 4. United Kingdom Private 9905 Bedfordshire Regiment 07/12/1916 IV. D. 10. United Kingdom Private 2621 North Staffordshire Regiment 04/08/1916 Age: 20 I. J. 18. United Kingdom Private 3673 Sherwood Foresters (Notts and Derby Regiment) 22/07/1916 I. H. 2. United Kingdom Corporal 23773 Bedfordshire Regiment 14/04/1917 Age: 24 VII. H. 5. United Kingdom Private 7693 Duke of Wellington's (West Riding Regiment) 18/02/1917 VI. A. 1. United Kingdom Second Lieutenant Royal Flying Corps 25/09/1917 Age: 22 XI. B. 6. United Kingdom Private 24497 Yorkshire Regiment 31/03/1917 Age: 22 IV. F. 7. United Kingdom Lance Corporal 493912 London Regiment 20/04/1917 Age: 20 VIII. J. 14. United Kingdom Private 2383 Sherwood Foresters (Notts and Derby Regiment) 05/07/1916 Age: 36 XII. C. 16. United Kingdom Rifleman S/17348 Rifle Brigade 09/04/1917 Age: 33 VII. A. 8. United Kingdom Private 202440 North Staffordshire Regiment 06/02/1917 IV. H. 9. United Kingdom Lance Corporal B/1366 Rifle Brigade 07/05/1917 Age: 23 IX. G. 15. United Kingdom Private 6972 King's Own Yorkshire Light Infantry 25/01/1917 IV. F. 11. United Kingdom Serjeant 9260 Leicestershire Regiment 04/05/1917 Age: 22 X. F. 8. United Kingdom Private 27685 Machine Gun Corps (Infantry) 10/04/1917 VII. E. 14. United Kingdom Private 19015 West Yorkshire Regiment (Prince of Wales's Own) 16/11/1916 II. J. 11. United Kingdom Serjeant 510015 London Regiment (London Scottish) 06/04/1917 Age: 28 VI. H. 12. United Kingdom Private 31129 Royal Scots 13/04/1917 VIII. F. 8. United Kingdom Rifleman 392449 London Regiment (Queen Victoria's Rifles) 22/04/1917 Age: 41 X. B. 6. United Kingdom Private 27047 Highland Light Infantry 17/11/1916 III. F. 12. United Kingdom Rifleman R/34498 King's Royal Rifle Corps 12/04/1917 Age: 38 VII. D. 4. United Kingdom Rifleman R/22124 King's Royal Rifle Corps 11/04/1917 VII. B. 11. United Kingdom Rifleman 4555 London Regiment (Finsbury Rifles) 19/02/1917 VI. A 7. United Kingdom Gunner 930108 Royal Field Artillery 13/03/1917 Age: 21 V. D. 4. United Kingdom Private 202880 Leicestershire Regiment 21/02/1917 V. B. 14. United Kingdom Lance Corporal 13929 Suffolk Regiment 15/05/1917 XI. A. 2. United Kingdom Private 325361 Durham Light Infantry 15/04/1917 Age: 26 VIII. H. 10. United Kingdom Gunner 16590 Royal Field Artillery 09/03/1917 V. C. 1. United Kingdom Second Lieutenant Royal Garrison Artillery 09/04/1917 Age: 28 V. J. 13. United Kingdom Lance Corporal 13357 Norfolk Regiment 22/05/1917 Age: 28 XII. A. 9. United Kingdom Private 38015 York and Lancaster Regiment 07/11/1916 IV. A. 5. United Kingdom Private 30581 Yorkshire Regiment 28/12/1916 Age: 20 III. H. 1. United Kingdom Private 511588 London Regiment (London Scottish) 27/03/1917 Age: 21 V. F. 4. United Kingdom Private 240431 Leicestershire Regiment 03/02/1917 IV. G. 9. United Kingdom Gunner 71428 Royal Garrison Artillery 08/04/1917 Age: 40 V. J. 14. United Kingdom Gunner 365100 Royal Garrison Artillery 06/03/1917 Age: 25 V. C. 9. United Kingdom Private S4/244156 Army Service Corps 18/02/1917 VI. A. 4. United Kingdom Private 31445 Worcestershire Regiment 29/04/1917 Age: 29 IX. F. 9. United Kingdom Lance Corporal 44144 Manchester Regiment 07/01/1917 Age: 22 III. J. 5. United Kingdom Private 44680 Manchester Regiment 04/04/1917 Age: 31 VI. G. 13. United Kingdom Rifleman 225555 Monmouthshire Regiment 18/03/1917 Age: 26 VI. D. 12. United Kingdom Private 201441 Leicestershire Regiment 03/03/1917 VI. B. 6. United Kingdom Private 4561 London Regiment 13/08/1916 II. F. 9. United Kingdom Private 41643 Lancashire Fusiliers 27/05/1918 Age: 22 XII. B. 10. United Kingdom Private 6520 Duke of Wellington's (West Riding Regiment) 19/01/1917 III. J. 12. United Kingdom Private 55197 Royal Welsh Fusiliers 25/04/1917 Age: 25 X. D. 9. United Kingdom Private 47853 Manchester Regiment 03/05/1917 X. G. 9. United Kingdom Rifleman S/26333 Rifle Brigade 04/05/1917 X. F. 14. United Kingdom Corporal 17812 Royal Flying Corps 30/04/1917 IX. F. 16. United Kingdom Private 12206 The King's (Liverpool Regiment) 26/03/1917 Age: 28 VI. E. 11. United Kingdom Rifleman 392621 London Regiment (Queen Victoria's Rifles) 16/04/1917 VIII. H. 11. United Kingdom Lance Corporal 27954 Yorkshire Regiment 13/04/1917 Age: 26 VII. F. 8. United Kingdom Lance Corporal 6506 York and Lancaster Regiment 24/11/1916 Age: 19 IV. D. 1. United Kingdom Private 2876 Lincolnshire Regiment 01/07/1916 I. E. 11. United Kingdom Private 4861 Sherwood Foresters (Notts and Derby Regiment) 19/08/1916 III. A. 14. United Kingdom Gunner 106466 Royal Field Artillery 06/04/1917 V. H. 15. United Kingdom Private 4319 Leicestershire Regiment 01/07/1916 I. E. 10. United Kingdom Private 201468 Suffolk Regiment 23/04/1917 Age: 39 IX. B. 4. United Kingdom Private 7050 Duke of Wellington's (West Riding Regiment) 02/11/1916 Age: 19 III. D. 13. United Kingdom Second Lieutenant Royal Flying Corps 04/04/1917 Age: 25 V. H. 6. United Kingdom Driver 60176 Royal Engineers 08/04/1917 Age: 28 VI. J. 3. United Kingdom Private 27333 Somerset Light Infantry 12/05/1917 X. H. 7. United Kingdom Corporal 78512 Royal Field Artillery 12/04/1918 Age: 22 IV. F. 15. United Kingdom Private 8182 East Yorkshire Regiment 02/04/1917 V. G. 12. United Kingdom Private 301105 Durham Light Infantry 21/04/1917 X. B. 9. United Kingdom Private 492906 London Regiment 03/04/1917 Age: 32 VI. G. 3. United Kingdom Private 16666 King's Shropshire Light Infantry 25/05/1917 Age: 19 XI. B. 4. United Kingdom Gunner 67989 Royal Garrison Artillery 03/07/1916 Age: 20 I. G. 12. United Kingdom Lance Bombardier 131686 Royal Field Artillery 06/04/1918 Age: 20 XII. B. 2. United Kingdom Lance Corporal 4926 Sherwood Foresters (Notts and Derby Regiment) 10/12/1916 III. H. 11. United Kingdom Private 253305 London Regiment (Royal Fusiliers) 09/04/1917 Age: 20 VII. A. 15. United Kingdom Lance Corporal 1456 London Regiment (London Rifle Brigade) 02/07/1916 II. D. 8. United Kingdom Private 40493 Royal Scots Fusiliers 29/04/1917 Age: 20 IX. D. 16. United Kingdom Private 26988 Wiltshire Regiment 30/04/1917 Age: 24 X. E. 6. United Kingdom Driver 35730 Royal Field Artillery 23/04/1917 IX. B. 2. United Kingdom Rifleman R/30251 King's Royal Rifle Corps 04/05/1917 Age: 27 X. F. 5. United Kingdom Private 4827 Lincolnshire Regiment 14/08/1916 Age: 34 I. J. 2. United Kingdom Private 20291 Gloucestershire Regiment 03/11/1916 Age: 20 IV. A. 11. United Kingdom Lance Corporal 11430 Royal Warwickshire Regiment 21/11/1916 Age: 20 IV. C. 8. United Kingdom Private 27983 Manchester Regiment 03/09/1916 Age: 19 IV. H. 15. United Kingdom Private 18/51 Northumberland Fusiliers 14/07/1916 Age: 36 II. E. 10. United Kingdom Private 36285 Yorkshire Regiment 03/04/1917 Age: 27 VI. G. 11. United Kingdom Lance Corporal B/2178 Rifle Brigade 29/04/1917 IX. F. 6. United Kingdom Second Lieutenant London Regiment (Royal Fusiliers) 05/03/1917 Age: 22 VI. B. 9. United Kingdom Private 22296 Wiltshire Regiment 12/04/1917 Age: 20 VIII. D. 2. United Kingdom Private 44824 Machine Gun Corps (Infantry) 28/01/1917 Age: 28 IV F. 12. United Kingdom Private 26181 King's Shropshire Light Infantry 10/04/1917 Age: 23 VII. E. 12. United Kingdom Private 4730 London Regiment (Royal Fusiliers) 25/07/1916 Age: 19 I. J. 13. United Kingdom Serjeant 200109 East Yorkshire Regiment 24/04/1917 Age: 24 X. C. 10. United Kingdom Rifleman R/32061 King's Royal Rifle Corps 14/04/1917 Age: 21 VIII. D. 3. United Kingdom Corporal 120542 Royal Engineers 06/09/1916 Age: 20 IV. G. 15. United Kingdom Private 311 York and Lancaster Regiment 30/10/1916 III. C. 14. United Kingdom Private 2453 King's Own Yorkshire Light Infantry 14/01/1917 Age: 21 IV. E. 11. United Kingdom Private 202563 Durham Light Infantry 25/04/1917 Age: 20 X. E. 2. United Kingdom Rifleman A/1073 King's Royal Rifle Corps 13/04/1917 Age: 27 VIII. D. 14. United Kingdom Lance Corporal 6233 West Yorkshire Regiment (Prince of Wales's Own) 12/02/1917 IV. J. 10. United Kingdom Second Lieutenant Grenadier Guards 18/05/1918 Age: 34 XII. B. 7. United Kingdom Serjeant 200960 South Staffordshire Regiment 22/03/1917 V. E 14. United Kingdom Bombardier 365648 Royal Garrison Artillery 06/03/1917 Age: 29 V. C. 7. United Kingdom Sapper 61719 Royal Engineers 01/07/1916 XII. C. 17. United Kingdom Driver T4/039000 Army Service Corps 11/04/1917 VIII. G. 7. United Kingdom Rifleman 451905 London Regiment (Finsbury Rifles) 16/02/1917 Age: 22 V. A. 5. United Kingdom Sapper 1165 Royal Engineers 05/01/1917 IV. F. 5. United Kingdom Private 9955 Cameronians (Scottish Rifles) 16/09/1916 II. G. 6. United Kingdom Private 26726 Somerset Light Infantry 11/04/1917 VIII. F. 14. United Kingdom Private 1376 Seaforth Highlanders 04/11/1916 Age: 25 IV. A. 12. United Kingdom Second Lieutenant Royal Flying Corps 23/08/1917 Age: 27 XI. A. 14. United Kingdom Sapper 130437 Royal Engineers 30/10/1916 Age: 19 III. C. 13. United Kingdom Private 5447 Royal Fusiliers 05/05/1917 IX. G. 11. United Kingdom Major Royal Garrison Artillery 17/03/1917 Age: 30 VI. D. 9. United Kingdom Private 36352 Yorkshire Regiment 07/05/1917 Age: 26 IX. G. 16. United Kingdom Private 2410 London Regiment (Royal Fusiliers) 09/07/1916 Age: 33 II. E. 7. United Kingdom Private 4483 Lincolnshire Regiment 02/07/1916 Age: 21 VI. D. 15. United Kingdom Gunner L/18547 Royal Field Artillery 21/11/1916 Age: 21 III. G. 14. United Kingdom Private 2046 Royal Scots 23/11/1916 IV. C. 13. United Kingdom Corporal 926 Manchester Regiment 19/11/1916 Age: 28 IV. B. 9. United Kingdom Private 3098 South Staffordshire Regiment 03/07/1916 I. F. 2. United Kingdom Private 16262 Royal Fusiliers 16/11/1916 II. J. 10. United Kingdom Pioneer 129981 Royal Engineers 07/09/1916 Age: 23 IV. G. 14. United Kingdom Corporal 6993 King's Shropshire Light Infantry 10/04/1917 Age: 33 VII. B. 7. United Kingdom Private 200640 London Regiment (Royal Fusiliers) 18/04/1917 Age: 23 VII. J. 8. United Kingdom Private 202017 Cameronians (Scottish Rifles) 25/04/1917 Age: 19 IX. B. 9. Canadian Sergeant 154044 Canadian Pioneers 19/04/1917 Age: 43 VIII. J. 11. United Kingdom Private 36866 Lancashire Fusiliers 03/02/1917 IV. H. 1. United Kingdom Private 52467 The King's (Liverpool Regiment) 12/04/1917 VIII. C. 10. United Kingdom Private 24958 Leicestershire Regiment 31/07/1916 Age: 25 II. E. 12. United Kingdom Private 48367 The King's (Liverpool Regiment) 14/04/1917 VII. H. 3. United Kingdom Private 250330 Durham Light Infantry 15/04/1917 VII. F. 14. United Kingdom Private 70814 The King's (Liverpool Regiment) 30/03/1917 V. F. 12. United Kingdom Private 4991 King's Own Yorkshire Light Infantry 12/11/1916 II. J. 2. United Kingdom Private M/348523 Army Service Corps 27/05/1918 Age: 35 XII. B. 11. United Kingdom Private 4098 Lincolnshire Regiment 01/07/1916 I. F. 10. United Kingdom Lance Corporal 14 Royal Army Medical Corps 15/02/1917 Age: 23 IV. J. 13. United Kingdom Rifleman 303323 London Regiment (London Rifle Brigade) 03/04/1917 Age: 19 V. G. 14. United Kingdom Private 20717 Royal Warwickshire Regiment 15/10/1916 II. H. 12. United Kingdom Lance Serjeant 2288 Sherwood Foresters (Notts and Derby Regiment) 23/12/1916 III. H. 2. United Kingdom Private 3539 King's Own Yorkshire Light Infantry 03/11/1916 III. D. 12. United Kingdom Private 36645 Northamptonshire Regiment 21/04/1918 II. F. 15. United Kingdom Private 40678 Royal Scots Fusiliers 12/01/1917 IV. F. 8. United Kingdom Corporal 200249 Durham Light Infantry 24/04/1917 Age: 20 IX. A. 9. United Kingdom Private 252337 London Regiment (Royal Fusiliers) 07/03/1917 V. C. 4. United Kingdom Corporal 3903 North Staffordshire Regiment 27/06/1916 Age: 27 I. D. 2. United Kingdom Lance Corporal 33073 Yorkshire Regiment 15/04/1917 Age: 25 VIII. G. 9. United Kingdom Second Lieutenant Royal Flying Corps 19/06/1916 Age: 28 I. D. 16. United Kingdom Gunner 102034 Royal Garrison Artillery 20/05/1917 Age: 36 XII. A. 3. United Kingdom Private 43903 King's Own Yorkshire Light Infantry 30/04/1917 Age: 19 X. E. 13. United Kingdom Private 1112 South Staffordshire Regiment 06/02/1917 Age: 32 IV. H. 7. United Kingdom Private 9585 South Staffordshire Regiment 04/07/1916 I. F. 4. United Kingdom Airman 2nd Class 50421 Royal Flying Corps 11/05/1917 Age: 25 X. H. 3. United Kingdom Serjeant 13758 Northumberland Fusiliers 26/04/1917 Age: 23 X. D. 5. United Kingdom Private 201367 Middlesex Regiment 11/04/1917 VII. B. 4. United Kingdom Second Lieutenant Suffolk Regiment 24/04/1917 Age: 23 X. C. 9. United Kingdom Private 23520 East Surrey Regiment 11/11/1916 Age: 44 III. D. 8. United Kingdom Private 45430 Machine Gun Corps (Infantry) 29/11/1916 III. G. 4. United Kingdom Private 4670 Sherwood Foresters (Notts and Derby Regiment) 27/06/1916 VI. F. 15. United Kingdom Rifleman R/11385 King's Royal Rifle Corps 02/05/1917 Age: 21 X. G. 8. United Kingdom Private 63562 Royal Fusiliers 29/04/1917 IX. F. 5. United Kingdom Private C/18381 Queen's Own (Royal West Kent Regiment) 05/05/1917 Age: 30 X. F. 9. United Kingdom Second Lieutenant King's Royal Rifle Corps 25/06/1916 Age: 21 I. D. 12. United Kingdom Private 17503 York and Lancaster Regiment 26/10/1916 Age: 20 III. C. 9. United Kingdom Corporal 17808 Essex Regiment 18/05/1917 Age: 21 XI. A. 7. United Kingdom Private 9164 Royal Berkshire Regiment 15/11/1916 III. E. 4. United Kingdom Sapper 941 Royal Engineers 14/11/1916 Age: 21 II. J. 9. United Kingdom Private 200876 East Yorkshire Regiment 22/04/1917 X. B. 12. United Kingdom Second Lieutenant Oxford and Bucks Light Infantry 10/04/1917 Age: 22 VIII. B. 4. United Kingdom Second Lieutenant Royal Flying Corps 24/03/1917 VI. E. 4. United Kingdom Private 31565 Wiltshire Regiment 06/01/1917 XI. C. 8. United Kingdom Private 13331 Middlesex Regiment 13/07/1916 XII. C. 7. United Kingdom Serjeant 493 South Staffordshire Regiment 03/07/1916 Age: 28 I. F. 3. United Kingdom Private 203310 Northumberland Fusiliers 26/04/1917 IX. C. 13. United Kingdom Private 241385 Middlesex Regiment 10/04/1917 Age: 34 VIII. G. 8. United Kingdom Private 32941 Manchester Regiment 25/04/1917 X. C. 12. United Kingdom Private 23985 Duke of Wellington's (West Riding Regiment) 07/04/1917 Age: 22 V. J. 9. United Kingdom Private 281687 London Regiment (Royal Fusiliers) 18/04/1917 Age: 21 VIII. J. 3. United Kingdom Private 26867 Wiltshire Regiment 12/04/1917 Age: 32 VIII. D. 1. United Kingdom Private 242343 Middlesex Regiment 11/04/1917 Age: 20 VII. C. 13. United Kingdom Private 251220 London Regiment (Royal Fusiliers) 10/04/1917 Age: 25 VIII. G. 5. United Kingdom Second Lieutenant London Regiment (Royal Fusiliers) 12/04/1917 Age: 21 VII. D. 1. United Kingdom Private M2/133372 Army Service Corps 07/04/1917 Age: 33 V. J. 11. United Kingdom Serjeant 17123 The King's (Liverpool Regiment) 11/04/1917 Age: 27 VIII. E. 13. United Kingdom Private M2/191188 Army Service Corps 08/04/1917 Age: 30 VI. J. 12. United Kingdom Private 6078 Royal Fusiliers 14/11/1916 III. E. 13. United Kingdom Private 11844 Duke of Cornwall's Light Infantry 11/04/1917 VII. C. 9. United Kingdom Private 16377 Yorkshire Regiment 04/04/1917 Age: 34 V. H. 12. United Kingdom Private 242188 Northumberland Fusiliers 19/04/1917 VII. J. 12. United Kingdom Private 27760 Border Regiment 18/11/1916 Age: 26 IV. C. 5. United Kingdom Private 25879 Leicestershire Regiment 07/05/1917 Age: 21 IX. H. 7. United Kingdom Rifleman 553159 London Regiment (Queen's Westminster Rifles) 08/04/1917 Age: 19 VI. J. 7. United Kingdom Private 2160 Sherwood Foresters (Notts and Derby Regiment) 30/08/1916 Age: 19 III. A. 6. United Kingdom Second Lieutenant Grenadier Guards 18/05/1918 XII. B. 6. United Kingdom Lance Corporal 17209 Dorsetshire Regiment 13/09/1916 Age: 19 III. A. 3. United Kingdom Lance Corporal 11081 King's Shropshire Light Infantry 30/04/1917 Age: 20 IX. F. 14. United Kingdom Private 1198 The Queen's (Royal West Surrey Regiment) 08/05/1917 Age: 24 IX. H. 8. United Kingdom Private 44035 King's Own Yorkshire Light Infantry 22/05/1917 XII. A. 10. United Kingdom Bombardier 34482 Royal Garrison Artillery 24/11/1916 Age: 22 IV. C. 14. United Kingdom Rifleman S/26239 Rifle Brigade 22/05/1917 Age: 33 XII. A. 12. United Kingdom Private 14382 Leicestershire Regiment 10/05/1917 Age: 21 X. H. 1. United Kingdom Private 201977 Border Regiment 27/04/1917 X. D. 6. United Kingdom Private 15346 Oxford and Bucks Light Infantry 15/05/1917 XI. A. 1. United Kingdom Private 4756 London Regiment (Royal Fusiliers) 02/07/1916 II. D. 10. United Kingdom Private 41644 Manchester Regiment 10/04/1917 VII. E. 11. United Kingdom Private 17671 Bedfordshire Regiment 25/06/1916 Age: 28 XII. C. 18. United Kingdom Rifleman B/733 Rifle Brigade 04/05/1917 Age: 24 X. F. 13. United Kingdom Lance Corporal 8919 Somerset Light Infantry 11/04/1917 Age: 24 VII. E. 10. United Kingdom Gunner 80665 Royal Garrison Artillery 12/04/1917 Age: 23 VII. D. 13. United Kingdom Corporal 120661 Royal Engineers 13/11/1916 Age: 18 II. J. 4. United Kingdom Private 43579 King's Own Yorkshire Light Infantry 11/04/1917 Age: 33 VIII. E. 9. United Kingdom Private 305926 Sherwood Foresters (Notts and Derby Regiment) 06/03/1917 V. C. 11. United Kingdom Private 241379 Border Regiment 28/04/1917 IX. D. 14. United Kingdom Lance Corporal 8651 Wiltshire Regiment 02/04/1917 VI. G. 9. United Kingdom Private 3490 South Staffordshire Regiment 04/07/1916 Age: 34 I. F. 1. United Kingdom Private 32876 King's Own Yorkshire Light Infantry 27/05/1918 XII. B. 8. United Kingdom Lance Corporal 9541 South Staffordshire Regiment 11/08/1916 Age: 22 XII. C. 8. United Kingdom Private 422371 London Regiment 15/02/1917 IV. J. 14. United Kingdom Private 241862 Middlesex Regiment 12/04/1917 Age: 28 VII. E. 1. United Kingdom Pioneer 129330 Royal Engineers 30/03/1917 Age: 26 VI. F. 8. United Kingdom Rifleman Z/116 Rifle Brigade 11/04/1917 VII. C. 4. United Kingdom Private 202947 Middlesex Regiment 13/04/1917 Age: 17 VIII. F. 7. United Kingdom Private 49876 Durham Light Infantry 14/05/1917 X. H. 10. United Kingdom Driver 82653 Royal Engineers 12/02/1917 IV. E. 15. United Kingdom Captain Royal Engineers 22/08/1916 Age: 23 III. A. 12. United Kingdom Gunner 69083 Royal Field Artillery 31/03/1917 VI. F. 14. United Kingdom Private 20019 Lincolnshire Regiment 07/12/1916 IV. D. 11. United Kingdom Serjeant 306367 Sherwood Foresters (Notts and Derby Regiment) 05/03/1917 V. C. 15. United Kingdom Private 24802 King's Own Yorkshire Light Infantry 09/03/1917 V. C. 2. United Kingdom Driver 1097 Royal Engineers 16/08/1916 Age: 22 II. F. 10. United Kingdom Serjeant B/140 Rifle Brigade 07/04/1917 Age: 37 V. J. 7. United Kingdom Lance Corporal 203286 Sherwood Foresters (Notts and Derby Regiment) 13/03/1917 Age: 25 V. D. 9. United Kingdom Private 50104 Suffolk Regiment 04/05/1917 X. F. 11. United Kingdom Private 290329 Northumberland Fusiliers 04/05/1917 Age: 30 X. F. 7. United Kingdom Private 1847 South Staffordshire Regiment 09/10/1916 Age: 21 III. B. 8. United Kingdom Driver T2/11330 Army Service Corps 09/02/1917 Age: 35 IV. J. 7. United Kingdom Rifleman 2151 Monmouthshire Regiment 02/07/1916 I. E. 4. United Kingdom Private 6169 York and Lancaster Regiment 15/11/1916 Age: 20 III. E. 10. United Kingdom Private 4060 North Staffordshire Regiment 03/07/1916 I. F. 13. 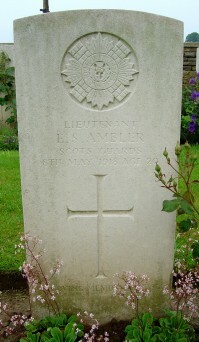 United Kingdom Private 38029 Royal Scots 10/04/1917 Age: 20 VIII. C. 12. United Kingdom Private 201684 Yorkshire Regiment 22/04/1917 IX. A. 6. United Kingdom Private 2448 Duke of Wellington's (West Riding Regiment) 18/11/1916 Age: 21 IV. C. 4. United Kingdom Lance Corporal 17952 King's Shropshire Light Infantry 27/04/1917 Age: 19 IX. E. 13. United Kingdom Corporal 38084 Royal Berkshire Regiment 01/06/1918 Age: 22 XI. C. 18. United Kingdom Private 30601 Durham Light Infantry 10/05/1917 Age: 27 X. H. 5. United Kingdom Lance Corporal 493504 London Regiment 20/04/1917 Age: 26 X. B. 1. United Kingdom Private 8032 South Staffordshire Regiment 16/12/1916 IV. D. 13. United Kingdom Sapper 164709 Royal Engineers 21/11/1916 Age: 32 III. G. 13. United Kingdom Private 2018 South Staffordshire Regiment 01/10/1916 Age: 17 III. B. 2. United Kingdom Rifleman 393855 London Regiment (Queen Victoria's Rifles) 24/04/1917 Age: 19 X. C. 11. United Kingdom Rifleman S/15672 Rifle Brigade 04/05/1917 Age: 24 X. F. 3. United Kingdom Private 4108 Leicestershire Regiment 03/07/1916 Age: 21 I. G. 13. United Kingdom Private 33491 Manchester Regiment 25/12/1916 Age: 27 XI. C. 6. United Kingdom Lance Corporal 19249 Lincolnshire Regiment 04/09/1916 Age: 22 II. G. 2. United Kingdom Rifleman 452896 London Regiment (Finsbury Rifles) 18/02/1917 Age: 22 V. A. 11. United Kingdom Private T4/172226 Army Service Corps 06/04/1917 Age: 33 V. J. 8. United Kingdom Private 22276 Wiltshire Regiment 02/01/1917 Age: 24 III. J. 4. United Kingdom Rifleman 391652 London Regiment (Queen Victoria's Rifles) 30/03/1917 V. F. 14. United Kingdom Second Lieutenant North Staffordshire Regiment 04/08/1916 I. J. 6. United Kingdom Private 25998 Middlesex Regiment 25/04/1917 Age: 23 X. D. 11. United Kingdom Second Lieutenant Royal Flying Corps 04/03/1917 Age: 19 VI. B. 11. United Kingdom Private 266223 Sherwood Foresters (Notts and Derby Regiment) 13/03/1917 Age: 20 V. D. 12. United Kingdom Lance Corporal 27225 East Yorkshire Regiment 16/04/1917 Age: 32 VII. G. 11. United Kingdom Gunner 10844 Royal Field Artillery 11/04/1917 VIII. A. 11. United Kingdom Private 202487 Sherwood Foresters (Notts and Derby Regiment) 14/03/1917 Age: 37 VI. D. 3. United Kingdom Private 5834 Gloucestershire Regiment 13/10/1916 II. H. 10. United Kingdom Private 3/8003 Yorkshire Regiment 25/04/1917 IX. E. 10. United Kingdom Private 17820 Bedfordshire Regiment 27/04/1917 IX D. 6. United Kingdom Gunner 785770 Royal Field Artillery 16/03/1917 Age: 19 V. D. 15. United Kingdom Lance Corporal 1756 Royal Warwickshire Regiment 18/10/1916 Age: 20 III. C. 3. United Kingdom Private 6647 York and Lancaster Regiment 29/01/1917 Age: 36 IV. G. 5. United Kingdom Driver T4/232297 Army Service Corps 24/02/1917 Age: 27 V. B. 13. United Kingdom Private 2945 Middlesex Regiment 24/04/1917 Age: 31 X. E. 3. United Kingdom Private 11472 King's Own Yorkshire Light Infantry 20/05/1917 Age: 26 XII. A. 2. United Kingdom Private 203192 East Yorkshire Regiment 24/04/1917 Age: 40 IX. B. 5. United Kingdom Second Lieutenant London Regiment (City of London Rifles) 12/02/1917 Age: 32 IV. J. 8. United Kingdom Serjeant 328 London Regiment (London Rifle Brigade) 07/09/1916 Age: 38 II. G. 3. United Kingdom Private 6088 York and Lancaster Regiment 11/02/1917 IV. J. 5. United Kingdom Private 3183 Royal Sussex Regiment 29/06/1916 Age: 29 I. E. 12. United Kingdom Private 6068 Machine Gun Corps (Infantry) 18/11/1916 Age: 26 II. J. 14. United Kingdom Serjeant 280601 London Regiment (Royal Fusiliers) 15/04/1917 Age: 19 VIII. H. 1. United Kingdom Second Lieutenant Royal Flying Corps 28/06/1917 IX. H. 14. United Kingdom Staff Captain Royal Field Artillery 02/04/1917 Age: 31 VI. G. 1. United Kingdom Lance Serjeant 200351 Sherwood Foresters (Notts and Derby Regiment) 16/02/1917 VI. A. 2. United Kingdom Rifleman S/24054 Rifle Brigade 04/05/1917 X. G. 12. United Kingdom Private 252088 London Regiment (Royal Fusiliers) 18/04/1917 VIII. J. 8. United Kingdom Private 1014 Sherwood Foresters (Notts and Derby Regiment) 24/12/1916 IV. E. 7. United Kingdom Private 325292 Durham Light Infantry 25/04/1917 IX. E. 1. United Kingdom Private 240639 Cameronians (Scottish Rifles) 16/04/1917 X. A. 7. United Kingdom Private 202898 Leicestershire Regiment 04/03/1917 Age: 39 VI. B. 5. United Kingdom Private 26796 Wiltshire Regiment 03/04/1917 Age: 40 V. H. 4. United Kingdom Private 200321 Yorkshire Regiment 04/05/1917 Age: 21 X. F. 10. United Kingdom Private 5399 London Regiment (Royal Fusiliers) 08/08/1916 II. E. 14. United Kingdom Private 5150257 London Regiment (London Scottish) 28/03/1917 Age: 26 V. F. 6. United Kingdom Private 202195 Suffolk Regiment 24/04/1917 X. C. 14. United Kingdom Private 202533 London Regiment (Royal Fusiliers) 12/03/1917 V. D. 8. United Kingdom Corporal 514072 London Regiment (London Scottish) 17/04/1917 Age: 32 VII. G. 15. United Kingdom Private 17855 The King's (Liverpool Regiment) 22/03/1917 V. E. 13. United Kingdom Corporal 240290 Border Regiment 24/04/1917 Age: 22 IX. A. 14. United Kingdom Lance Corporal 3036 South Staffordshire Regiment 02/07/1916 Age: 22 I. F. 9. United Kingdom Lance Corporal 6629 London Regiment 16/08/1916 Age: 24 I. J. 1. United Kingdom Private 1066 South Staffordshire Regiment 24/06/1916 XII. C. 3. United Kingdom Private 19627 Oxford and Bucks Light Infantry 26/04/1917 X. D. 13. United Kingdom Private 2209 North Staffordshire Regiment 16/07/1916 I. H. 9. United Kingdom Private 36616 Northamptonshire Regiment 21/04/1918 II. G. 15. United Kingdom Rifleman A/203209 King's Royal Rifle Corps 27/09/1916 Age: 24 II. G. 12. United Kingdom Gunner L/17625 Royal Field Artillery 24/10/1916 IV. A. 4. United Kingdom Private 4050 Sherwood Foresters (Notts and Derby Regiment) 01/07/1916 Age: 34 VI. C. 15. United Kingdom Private 51681 The King's (Liverpool Regiment) 24/11/1916 Age: 20 III. G. 10. United Kingdom Private 34502 The King's (Liverpool Regiment) 11/04/1917 VII. D. 10. United Kingdom Private 7270 London Regiment (London Scottish) 09/08/1916 II. F. 3. United Kingdom Lance Corporal R/31392 King's Royal Rifle Corps 15/04/1917 VII. H. 9. United Kingdom Rifleman R/32207 King's Royal Rifle Corps 31/03/1917 Age: 41 VI. F. 13. United Kingdom Private 32987 King's Own Yorkshire Light Infantry 23/11/1916 Age: 20 III. G. 11. United Kingdom Private 11813 Duke of Cornwall's Light Infantry 11/04/1917 Age: 20 VII. D. 6. United Kingdom Rifleman 392131 London Regiment (Queen Victoria's Rifles) 17/04/1917 Age: 23 VII. G. 9. United Kingdom Private 4379 North Staffordshire Regiment 24/06/1916 Age: 18 I. D. 10. United Kingdom Second Lieutenant Royal Flying Corps 27/02/1917 Age: 23 V. B. 3. United Kingdom Private 13558 The King's (Liverpool Regiment) 08/04/1917 V. J. 3. United Kingdom Gunner 98214 Royal Garrison Artillery 25/03/1917 Age: 35 VI. E. 5. United Kingdom Rifleman A/222 King's Royal Rifle Corps 01/05/1917 X. G. 1. United Kingdom Second Lieutenant Royal Flying Corps 20/05/1917 Age: 27 XII. A. 5. United Kingdom Lieutenant London Regiment (Royal Fusiliers) 01/07/1916 Age: 21 II. D. 2. United Kingdom Private 3033 The King's (Liverpool Regiment) 07/04/1916 Age: 19 XI. C. 10. United Kingdom Private 43570 King's Own Yorkshire Light Infantry 11/04/1917 VIII. E. 11. United Kingdom Private 17757 King's Shropshire Light Infantry 11/04/1917 VII. E. 5. United Kingdom Private 36971 Lancashire Fusiliers 14/12/1916 Age: 24 III. H. 6. United Kingdom Private 491097 London Regiment 19/04/1917 VII. J. 11. United Kingdom Private 29653 Royal Welsh Fusiliers 27/04/1917 Age: 24 IX. E. 16. United Kingdom Sapper 5651 Royal Engineers 07/03/1917 Age: 46 VI. C. 5. United Kingdom Private 20574 Lancashire Fusiliers 03/02/1917 XI. C. 1. United Kingdom Pioneer 114955 Royal Engineers 23/03/1918 XII. B. 1. United Kingdom Private 40443 Royal Scots Fusiliers 25/04/1917 Age: 19 X. D. 2. United Kingdom Private 203414 Sherwood Foresters (Notts and Derby Regiment) 03/03/1917 Age: 29 VI. B. 4. United Kingdom Serjeant 31379 Royal Garrison Artillery 31/03/1917 Age: 25 VI. F. 4. United Kingdom Serjeant 201580 North Staffordshire Regiment 18/03/1917 VI. D. 13. United Kingdom Private 41772 Manchester Regiment 25/04/1917 Age: 19 IX. E. 12. United Kingdom Rifleman 3319 London Regiment (Queen Victoria's Rifles) 02/07/1916 II. D. 9. United Kingdom Private 53212 Royal Fusiliers 19/04/1917 Age: 27 X. A. 12. United Kingdom Sapper 79578 Royal Engineers 29/03/1917 V. F. 3. United Kingdom Second Lieutenant Leicestershire Regiment 07/05/1917 Age: 25 IX. H. 2. United Kingdom Private 262967 Middlesex Regiment 02/04/1917 Age: 19 V. G. 2. United Kingdom Private 201867 East Yorkshire Regiment 25/04/1917 X. E. 1. United Kingdom Second Lieutenant Sherwood Foresters (Notts and Derby Regiment) 20/12/1916 Age: 37 IV. E. 2. United Kingdom Private 33459 Royal Scots Fusiliers 27/04/1917 Age: 30 IX. D. 11. United Kingdom Private 52805 The King's (Liverpool Regiment) 15/11/1916 III. E. 7. United Kingdom Driver 1627 Royal Field Artillery 07/07/1916 Age: 24 VI. A. 14. United Kingdom Rifleman 4399 London Regiment (The Rangers) 02/07/1916 II. D. 4. United Kingdom Private DM2/097094 Army Service Corps 21/03/1917 VI. E. 2. United Kingdom Private 39773 Lancashire Fusiliers 20/11/1916 Age: 23 III. F. 4. United Kingdom Private 20372 Worcestershire Regiment 19/10/1916 Age: 21 II. H. 15. United Kingdom Private 6001 West Yorkshire Regiment (Prince of Wales's Own) 21/01/1917 Age: 27 IV. F. 10. United Kingdom Private 43785 Manchester Regiment 25/04/1917 X. D. 12. United Kingdom Private 16882 Argyll and Sutherland Highlanders 12/05/1917 Age: 38 X. H. 8. United Kingdom Driver 20960 Royal Field Artillery 12/10/1916 III. B. 10. United Kingdom Corporal 113018 Royal Engineers 28/06/1916 Age: 19 I. E. 15. United Kingdom Private 34257 The King's (Liverpool Regiment) 22/11/1916 Age: 22 III. G. 12. United Kingdom Serjeant 16250 The King's (Liverpool Regiment) 24/04/1917 Age: 34 IX. A. 12. United Kingdom Lance Serjeant 2374 Sherwood Foresters (Notts and Derby Regiment) 14/01/1917 Age: 39 III. J. 10. United Kingdom Rifleman S/24674 Rifle Brigade 01/05/1917 Age: 21 X. E. 14. United Kingdom Corporal 143017 Royal Engineers 29/06/1916 Age: 23 I. E. 13. United Kingdom Lieutenant Royal Garrison Artillery 10/03/1917 Age: 33 VI. C. 13. United Kingdom Private 281587 London Regiment (Royal Fusiliers) 09/03/1917 VI. C. 10. United Kingdom Lance Corporal 3886 London Regiment (The Rangers) 03/07/1916 Age: 25 II. D. 13. United Kingdom Private 202248 Yorkshire Regiment 26/04/1917 Age: 20 IX. C. 14. United Kingdom Private 34852 Manchester Regiment 30/01/1917 Age: 37 IV. F. 14. United Kingdom Lieutenant Royal Field Artillery 15/04/1917 VIII. H. 4. United Kingdom Lance Corporal 4334 London Regiment (London Scottish) 27/08/1916 Age: 19 III. A. 9. United Kingdom Private 37121 The Queen's (Royal West Surrey Regiment) 05/05/1917 Age: 28 IX. G. 3. United Kingdom Lance Corporal R/14204 King's Royal Rifle Corps 11/04/1917 Age: 20 VII. D. 11. United Kingdom Private 60299 Devonshire Regiment 11/04/1917 Age: 35 VIII. A. 6. United Kingdom Lance Corporal 1307 West Yorkshire Regiment (Prince of Wales's Own) 05/02/1917 Age: 22 IV. H. 6. United Kingdom Serjeant 11868 Duke of Cornwall's Light Infantry 13/04/1917 VII. D. 5. United Kingdom Private 4225 North Staffordshire Regiment 07/07/1916 I. H. 14. United Kingdom Rifleman 302795 London Regiment (London Rifle Brigade) 13/04/1917 VII. C. 14. United Kingdom Serjeant 12233 The King's (Liverpool Regiment) 06/04/1917 Age: 33 VI. H. 6. United Kingdom Lieutenant King's Royal Rifle Corps 09/04/1917 Age: 26 VIII. A. 9. United Kingdom Private 1550 Worcestershire Regiment 21/10/1916 Age: 19 III. C. 6. United Kingdom Private 55778 Machine Gun Corps (Infantry) 02/04/1917 Age: 34 VI. G. 5. United Kingdom Corporal 33106 Yorkshire Regiment 15/04/1917 VII. G. 3. United Kingdom Private 29105 Highland Light Infantry 28/11/1916 III. G. 6. United Kingdom Private 70887 Sherwood Foresters (Notts and Derby Regiment) 24/02/1917 Age: 30 V. B. 8. United Kingdom Private G/43923 Middlesex Regiment 16/11/1916 Age: 29 III. F. 13. United Kingdom Rifleman 15727 Monmouthshire Regiment 01/10/1916 XII. C. 11. United Kingdom Lieutenant King's Royal Rifle Corps 17/11/1916 Age: 25 III. E. 1. United Kingdom Private 5763 King's Own Yorkshire Light Infantry 12/02/1917 IV. J. 6. United Kingdom Private 20765 King's Shropshire Light Infantry 27/04/1917 IX. E. 15. United Kingdom Private 66715 Machine Gun Corps (Infantry) 06/05/1917 Age: 19 IX. G. 14. United Kingdom Private 9985 Manchester Regiment 04/05/1917 Age: 25 X. F. 12. United Kingdom Sapper 1302 Royal Engineers 05/07/1916 Age: 19 II. E. 4. United Kingdom Private 6523 King's Own Yorkshire Light Infantry 03/02/1917 Age: 19 IV. G. 10. United Kingdom Private 203238 King's Own Yorkshire Light Infantry 19/02/1917 V. A. 2. United Kingdom Serjeant 2056 Royal Fusiliers 19/11/1916 Age: 24 III. F. 6. United Kingdom Private 250923 Durham Light Infantry 15/04/1917 Age: 21 VIII. H. 12. United Kingdom Lieutenant Colonel Royal Army Medical Corps 22/12/1916 Age: 40 III. H. 3. United Kingdom Private 242604 Sherwood Foresters (Notts and Derby Regiment) 11/03/1917 V. D. 1. United Kingdom Private G/763 The Buffs (East Kent Regiment) 11/11/1916 III. D. 6. United Kingdom Private 8610 Duke of Wellington's (West Riding Regiment) 23/01/1917 IV. G. 1. United Kingdom Private 26598 Wiltshire Regiment 11/04/1917 Age: 29 VII. B. 14. United Kingdom Second Lieutenant Middlesex Regiment 02/07/1916 Age: 22 I. E. 2. United Kingdom Corporal 13162 Highland Light Infantry 18/11/1916 Age: 32 III. F. 8. United Kingdom Private 33450 Yorkshire Regiment 06/04/1917 Age: 26 VI. H. 4. United Kingdom Private 3905 Sherwood Foresters (Notts and Derby Regiment) 15/09/1916 III. A. 2. United Kingdom Private 4203 York and Lancaster Regiment 16/11/1916 III. F. 14. United Kingdom Private 241181 King's Own Yorkshire Light Infantry 30/01/1917 Age: 22 XI. C. 3. United Kingdom Second Lieutenant Royal Flying Corps 16/05/1917 Age: 22 XI. A. 4. United Kingdom Private 40847 King's Own Yorkshire Light Infantry 11/04/1917 Age: 26 VII. B. 13. United Kingdom Private 4617 London Regiment (Royal Fusiliers) 06/07/1916 II. E. 3. United Kingdom Private 18788 Somerset Light Infantry 12/04/1917 Age: 23 VIII F. 1. United Kingdom Private 40569 Royal Scots Fusiliers 05/04/1917 Age: 22 VI. H. 2. United Kingdom Lance Serjeant 1121 Royal Scots 21/11/1916 Age: 29 IV. C. 9. United Kingdom Serjeant 36380 Machine Gun Corps (Infantry) 16/04/1917 Age: 24 VII. G. 8. United Kingdom Private 10920 King's Own Scottish Borderers 22/04/1917 Age: 24 VII. J. 15. United Kingdom Lance Corporal 28541 Cameronians (Scottish Rifles) 17/04/1917 Age: 30 VII. J. 10. United Kingdom Private 18110 King's Shropshire Light Infantry 10/04/1917 Age: 30 VIII. B. 12. United Kingdom Bombardier 48101 Royal Field Artillery 03/08/1916 I. J. 9. United Kingdom Serjeant 7981 South Staffordshire Regiment 15/10/1916 Age: 23 III. C. 1. United Kingdom Gunner 37154 Royal Garrison Artillery 11/04/1917 VIII. E. 6. United Kingdom Private 307040 Sherwood Foresters (Notts and Derby Regiment) 17/02/1917 V. A. 6. United Kingdom Gunner 72014 Royal Garrison Artillery 21/04/1917 Age: 41 X. B. 8. United Kingdom Private 27697 Lincolnshire Regiment 07/04/1917 Age: 27 V. J. 6. United Kingdom Private 242552 South Staffordshire Regiment 02/03/1917 VI. B. 1. United Kingdom Rifleman S/26114 Rifle Brigade 29/04/1917 Age: 24 IX. F. 7. United Kingdom Gunner 83843 Royal Field Artillery 15/04/1917 Age: 21 VII. H. 1. United Kingdom Serjeant 10692 The King's (Liverpool Regiment) 07/05/1917 IX. G. 13. United Kingdom Private 235178 Yorkshire Regiment 26/04/1917 Age: 34 IX. C. 11. United Kingdom Corporal 1930 Royal Fusiliers 21/11/1916 IV. C. 7. United Kingdom Driver T2/018096 Army Service Corps 14/11/1916 II. J. 7. United Kingdom Private 4620 Leicestershire Regiment 08/08/1916 Age: 21 I. J. 4. United Kingdom Private 5314 South Staffordshire Regiment 18/08/1916 Age: 31 II. F. 12. United Kingdom Rifleman 371145 London Regiment (Post Office Rifles) 19/03/1917 Age: 35 V. E. 5. United Kingdom Corporal 200452 Sherwood Foresters (Notts and Derby Regiment) 17/03/1917 Age: 28 VI. D. 7. United Kingdom Corporal 21866 King's Own Yorkshire Light Infantry 10/04/1917 Age: 27 VIII. G. 6. United Kingdom Rifleman R/9140 King's Royal Rifle Corps 03/07/1916 I. F. 8. United Kingdom Private 20002 Leicestershire Regiment 14/01/1917 Age: 33 IV. E. 12. United Kingdom Private 36344 Machine Gun Corps (Infantry) 10/04/1917 Age: 26 VIII. C. 4. United Kingdom Rifleman S/2602 Rifle Brigade 12/05/1917 Age: 28 X. H. 6. United Kingdom Second Lieutenant Royal Berkshire Regiment 24/01/1917 Age: 26 III. J. 14. United Kingdom Private 1486 The Loyal North Lancashire Regiment 02/04/1916 Age: 20 XI. C. 9. United Kingdom Private 41824 Yorkshire Regiment 12/04/1917 Age: 24 IV. B. 8. United Kingdom Private 3703 Cameronians (Scottish Rifles) 26/09/1916 II. G. 11. United Kingdom Gunner 365092 Royal Garrison Artillery 29/12/1916 III. J. 3. United Kingdom Corporal 282357 London Regiment (Royal Fusiliers) 07/03/1917 Age: 22 VI. C. 2. United Kingdom Rifleman 323524 London Regiment (City of London Rifles) 08/03/1917 VI. C. 1. United Kingdom Private 29068 Essex Regiment 11/05/1917 X. H. 4. United Kingdom Private 3007 Sherwood Foresters (Notts and Derby Regiment) 06/08/1916 Age: 18 I. J. 5. United Kingdom Private 18834 Northumberland Fusiliers 01/05/1917 X. E. 10. United Kingdom Private 325679 Durham Light Infantry 25/04/1917 Age: 36 IX. C. 3. United Kingdom Private 42254 Durham Light Infantry 11/04/1917 Age: 27 VIII. A. 4. United Kingdom Private G/15637 The Buffs (East Kent Regiment) 06/05/1917 Age: 20 IX. H. 1. United Kingdom Driver 11975 Royal Horse Artillery 03/04/1917 Age: 38 V. H. 8. United Kingdom Private 240957 Border Regiment 13/04/1917 Age: 19 VII. D. 8. United Kingdom Private 5871 5th (Royal Irish) Lancers 10/04/1917 VII. A. 12. United Kingdom Private 1805 6th Dragoon Guards (Carabiniers) 08/04/1917 Age: 28 V. J. 15. United Kingdom Rifleman 471634 London Regiment (The Rangers) 07/04/1917 Age: 24 V. J. 10. United Kingdom Private 35605 King's Own Yorkshire Light Infantry 10/04/1917 Age: 26 VII. A. 4. United Kingdom Private 40725 Royal Scots Fusiliers 29/04/1917 Age: 38 IX. D. 15. United Kingdom Sapper 2072 Royal Engineers 02/11/1916 Age: 22 IV. A. 10. United Kingdom Private 203161 Yorkshire Regiment 02/05/1917 X. G. 5. United Kingdom Private 14055 Argyll and Sutherland Highlanders 30/04/1917 X. E. 4. United Kingdom Private 9234 Manchester Regiment 25/04/1917 Age: 19 IX. B. 12. United Kingdom Gunner 313 Royal Garrison Artillery 24/07/1916 Age: 21 I. J. 14. United Kingdom Private 57443 The King's (Liverpool Regiment) 05/01/1917 Age: 23 IV. F. 4. United Kingdom Serjeant 1727 Argyll and Sutherland Highlanders 15/11/1916 Age: 24 IV. B. 8. United Kingdom Private 240748 Border Regiment 24/04/1917 Age: 39 X. C. 6. United Kingdom Lieutenant Royal Flying Corps 25/09/1917 Age: 22 XI. B. 7. United Kingdom Private 11033 Manchester Regiment 20/04/1917 Age: 29 VII. J. 13. United Kingdom Private 430 Durham Light Infantry 24/03/1917 Age: 38 VI. E. 1. United Kingdom Private 5981 Middlesex Regiment 18/10/1916 Age: 35 III. C. 2. United Kingdom Private 27749 The King's (Liverpool Regiment) 13/04/1917 VIII. D. 9. United Kingdom Private 26160 Bedfordshire Regiment 06/03/1917 Age: 25 V. C. 13. United Kingdom Private 1404 Royal Fusiliers 02/07/1916 Age: 20 I. E. 5. United Kingdom Private 20530 Lancashire Fusiliers 21/10/1916 Age: 35 IV. A. 2. United Kingdom Private 281681 London Regiment (Royal Fusiliers) 09/04/1917 Age: 21 VIII. A. 2. United Kingdom Second Lieutenant Manchester Regiment 29/04/1917 Age: 22 IX. D. 8. United Kingdom Rifleman Y/197 King's Royal Rifle Corps 13/04/1917 Age: 19 VIII. F. 6. United Kingdom Flight Serjeant 5288 Royal Flying Corps 25/01/1918 Age: 21 XI. B. 13. United Kingdom Private 34821 Royal Scots Fusiliers 24/04/1917 Age: 21 IX. A. 7. United Kingdom Staff Serjeant 154 Royal Field Artillery 14/10/1916 Age: 43 II. H. 13. United Kingdom Second Lieutenant London Regiment (Royal Fusiliers) 08/04/1917 V. J. 4. United Kingdom Private 20802 Sherwood Foresters (Notts and Derby Regiment) 14/09/1916 Age: 33 II. G. 5. United Kingdom Private 4316 London Regiment 03/07/1916 Age: 19 II. D. 11. United Kingdom Lance Corporal 71471 Machine Gun Corps (Infantry) 01/04/1917 Age: 22 VI. F. 6. United Kingdom Serjeant 626 Royal Flying Corps 04/03/1917 Age: 22 VI. B. 10. United Kingdom Private 34640 King's Own Yorkshire Light Infantry 02/05/1917 Age: 33 X. G. 11. United Kingdom Private 7292 West Yorkshire Regiment (Prince of Wales's Own) 08/11/1916 Age: 26 IV. A. 14. United Kingdom Private 8047 Middlesex Regiment 13/07/1916 XII. C. 4. United Kingdom Private 19270 The King's (Liverpool Regiment) 01/03/1917 V. B. 2. United Kingdom Private 46835 Manchester Regiment 28/03/1917 Age: 23 V. F. 5. United Kingdom Private 265382 Sherwood Foresters (Notts and Derby Regiment) 18/02/1917 V. A. 12. United Kingdom Second Lieutenant Royal Flying Corps 01/05/1917 X. G. 4. United Kingdom Lieutenant Royal Flying Corps 06/03/1918 Age: 19 XI. B. 15. United Kingdom Private 6628 York and Lancaster Regiment 16/02/1917 Age: 22 V. A. 13. United Kingdom Lance Corporal 180 London Regiment (London Rifle Brigade) 02/07/1916 Age: 22 II. D. 5. United Kingdom Private 7765 Sherwood Foresters (Notts and Derby Regiment) 08/02/1917 IV. H. 10. United Kingdom Private 8497 Wiltshire Regiment 09/01/1917 Age: 30 III. J. 8. United Kingdom Lance Corporal 2389 Middlesex Regiment 09/08/1916 Age: 19 II. F. 6. United Kingdom Private 253280 London Regiment (Royal Fusiliers) 20/04/1917 Age: 27 X. B. 4. United Kingdom Lance Corporal 40830 Manchester Regiment 21/02/1917 Age: 19 VI. A. 90. United Kingdom Private 37806 Northamptonshire Regiment 21/04/1918 Age: 32 XI. C. 11. United Kingdom Private 26627 Wiltshire Regiment 11/04/1917 Age: 33 VII. C. 7. United Kingdom Pioneer 220544 Royal Engineers 07/02/1917 IV. H. 3. United Kingdom Second Lieutenant Royal Flying Corps 16/03/1917 Age: 25 V. E. 2. United Kingdom Private 4794 Lincolnshire Regiment 07/07/1916 I. G. 2. United Kingdom Private 43213 Cameronians (Scottish Rifles) 16/09/1916 II. G. 7. United Kingdom Private 2052 Sherwood Foresters (Notts and Derby Regiment) 03/07/1916 Age: 20 I. G. 11. United Kingdom Private 40761 Royal Scots Fusiliers 26/04/1917 Age: 41 IX. C. 9. United Kingdom Private 241541 Middlesex Regiment 12/04/1917 Age: 31 VIII. F. 5. United Kingdom Second Lieutenant Border Regiment 15/04/1917 Age: 20 VII. F. 13. United Kingdom Private 202588 North Staffordshire Regiment 15/02/1917 Age: 33 IV. J. 12. United Kingdom Private 34641 King's Own Yorkshire Light Infantry 03/05/1917 X. G. 14. United Kingdom Sapper 153885 Royal Engineers 08/04/1917 V. J. 2. United Kingdom Gunner 55811 Royal Garrison Artillery 09/09/1916 II. G. 4. United Kingdom Private 52099 The King's (Liverpool Regiment) 12/04/1917 VII. C. 2. United Kingdom Private 2781 Lincolnshire Regiment 18/08/1916 II. F. 11. United Kingdom Lance Corporal 4334 Sherwood Foresters (Notts and Derby Regiment) 21/07/1916 Age: 35 I. H. 3. United Kingdom Private 18774 Northumberland Fusiliers 13/04/1917 VII. F. 1. United Kingdom Private 28/45 Northumberland Fusiliers 12/04/1917 Age: 19 VIII. C. 5. United Kingdom Corporal 202554 Durham Light Infantry 27/04/1917 Age: 28 IX. C. 16. United Kingdom Rifleman S/30365 Rifle Brigade 05/05/1917 IX. G. 1. United Kingdom Private 253434 London Regiment (Royal Fusiliers) 13/04/1917 Age: 21 VII. F. 4. United Kingdom Private 5058 East Surrey Regiment 04/05/1917 Age: 21 X. G. 13. United Kingdom Private 7586 Durham Light Infantry 25/04/1917 X. D. 1. United Kingdom Private 43337 Royal Scots Fusiliers 29/04/1917 IX. F. 10. United Kingdom Private 6807 Cameronians (Scottish Rifles) 18/04/1917 Age: 36 X. A. 10. United Kingdom Private 205316 Middlesex Regiment 11/04/1917 Age: 19 VII. B. 8. United Kingdom Lance Corporal 8837 Lincolnshire Regiment 03/04/1917 VI. G. 12. United Kingdom Private 5396 Leicestershire Regiment 09/09/1916 III. A. 4. United Kingdom Lieutenant Royal Flying Corps 24/03/1917 Age: 24 VI. E. 7. United Kingdom Private 41117 The Queen's (Royal West Surrey Regiment) 17/03/1917 Age: 41 V. E. 4. United Kingdom Private 28187 East Yorkshire Regiment 14/11/1916 Age: 19 III. E. 9. United Kingdom Private 202423 Suffolk Regiment 27/04/1917 IX. D. 5. United Kingdom Major Royal Field Artillery 01/04/1917 Age: 32 V. G. 4. United Kingdom Private 39822 Lancashire Fusiliers 22/11/1916 Age: 25 IV. C. 12. United Kingdom Private M2/194358 Royal Army Medical Corps 11/04/1917 VII. B. 3. United Kingdom Airman 2nd Class (Gnr. Obs.) 16789 Royal Flying Corps 23/04/1917 Age: 19 X. C. 1. United Kingdom Gunner 70486 Royal Field Artillery 06/04/1917 V. H. 13. United Kingdom Private 1073 Royal Fusiliers 24/06/1916 Age: 26 I. D. 13. United Kingdom Lance Corporal 27795 Lincolnshire Regiment 03/04/1917 Age: 23 V. G. 10. United Kingdom Private 201210 Sherwood Foresters (Notts and Derby Regiment) 10/03/1917 Age: 21 VI. C. 6. United Kingdom Gunner 85775 Royal Garrison Artillery 11/05/1917 Age: 29 X. H. 2. United Kingdom Gunner 28875 Royal Garrison Artillery 05/04/1917 V. H. 11. United Kingdom Private 3643 Seaforth Highlanders 13/11/1916 IV. B. 6. United Kingdom Corporal 2872 Sherwood Foresters (Notts and Derby Regiment) 14/07/1916 Age: 20 I. H. 11. United Kingdom Second Lieutenant Sherwood Foresters (Notts and Derby Regiment) 06/03/1917 Age: 19 V. C. 5. United Kingdom Private 29093 Duke of Cornwall's Light Infantry 15/04/1917 VII. G. 13. United Kingdom Gunner 940567 Royal Field Artillery 09/07/1916 Age: 18 II. E. 6. United Kingdom Private 241003 Cameronians (Scottish Rifles) 25/05/1917 Age: 20 XI. B. 3. United Kingdom Private 514323 London Regiment (London Scottish) 10/04/1917 VII. A. 5. United Kingdom Private 37809 Manchester Regiment 24/04/1917 X. C. 8. United Kingdom Private 242591 King's Own Yorkshire Light Infantry 14/02/1917 IV. J. 9. United Kingdom Sapper 43055 Royal Engineers 03/07/1916 Age: 19 I. G. 9. United Kingdom Private 22798 The King's (Liverpool Regiment) 07/03/1917 Age: 24 V. C. 3. United Kingdom Private 39830 King's Own Yorkshire Light Infantry 09/05/1917 Age: 21 IX. H. 11. United Kingdom Private 29060 Duke of Cornwall's Light Infantry 08/05/1917 Age: 26 IX. H. 5. United Kingdom Private 240744 Middlesex Regiment 06/04/1917 Age: 36 VI. H. 10. United Kingdom Private 11424 Royal Warwickshire Regiment 25/06/1916 I. D. 11. United Kingdom Private SR/10050 Leicestershire Regiment 04/05/1917 Age: 24 X. F. 2. United Kingdom Rifleman 4540 London Regiment (Finsbury Rifles) 16/02/1917 Age: 21 VI. A. 3. United Kingdom Private 3157 London Regiment (Royal Fusiliers) 03/07/1916 Age: 29 II. E. 2. United Kingdom Lieutenant Royal Flying Corps 30/04/1917 IX. F. 15. United Kingdom Rifleman A/1757 King's Royal Rifle Corps 13/04/1917 VII. F. 11. United Kingdom Serjeant 1124 Royal Engineers 20/11/1916 Age: 24 IV. B. 12. United Kingdom Rifleman 321906 London Regiment (City of London Rifles) 27/02/1917 Age: 20 V. B. 5. United Kingdom Lance Corporal 24198 Wiltshire Regiment 10/04/1917 VII. A. 2. United Kingdom Sapper 504555 Royal Engineers 05/03/1917 Age: 24 VI. B. 8. United Kingdom Sapper 101617 Royal Engineers 28/11/1916 III. G. 5. United Kingdom Private 11145 Northumberland Fusiliers 12/05/1917 Age: 23 X. H. 9. United Kingdom Lance Corporal 40385 Royal Scots Fusiliers 20/04/1917 VII. J. 14. United Kingdom Private 20734 Yorkshire Regiment 03/04/1917 Age: 21 V. G. 9. United Kingdom Corporal 2315 Sherwood Foresters (Notts and Derby Regiment) 03/07/1916 Age: 20 I. F. 11. United Kingdom Private 24128 Royal Welsh Fusiliers 24/04/1917 Age: 26 X. C. 7. United Kingdom Captain Northumberland Fusiliers 16/04/1917 Age: 32 VIII. H. 13. Canadian Lieutenant Canadian Field Artillery 01/05/1917 X. G. 3. United Kingdom Private 6852 Middlesex Regiment 14/07/1916 II. E. 8. United Kingdom Rifleman 1648 London Regiment (The Rangers) 21/07/1916 I. H. 4. United Kingdom Serjeant (Pilot) 23959 Royal Flying Corps 25/01/1918 Age: 24 XI. B. 14. United Kingdom Lance Corporal 6935 Duke of Wellington's (West Riding Regiment) 23/02/1917 V. B. 12. United Kingdom Private 1962 Army Cyclist Corps 14/03/1917 V. D. 11. United Kingdom Rifleman S/30599 Rifle Brigade 04/05/1917 X. F. 4. United Kingdom Private 31892 Wiltshire Regiment 14/04/1917 Age: 36 VIII. H. 8. United Kingdom Gunner 7917 Royal Garrison Artillery 06/04/1917 Age: 25 VI. H. 11. United Kingdom Private 325988 Durham Light Infantry 24/04/1917 Age: 20 IX. C. 6. United Kingdom Gunner 125743 Royal Field Artillery 31/10/1916 Age: 24 III. D. 14. United Kingdom Rifleman 552397 London Regiment (Queen's Westminster Rifles) 15/04/1917 Age: 22 VIII. H. 5. United Kingdom Private 7286 West Yorkshire Regiment (Prince of Wales's Own) 29/01/1917 XII. C. 14. United Kingdom Second Lieutenant Royal Flying Corps 27/02/1917 Age: 27 V. B. 4. United Kingdom Rifleman 203652 Rifle Brigade 09/05/1917 IX. H. 12. United Kingdom Rifleman C/1751 King's Royal Rifle Corps 24/04/1917 Age: 26 IX. A. 8. United Kingdom Private 2219 North Staffordshire Regiment 26/06/1916 I. D. 4. United Kingdom Private 7141 London Regiment 31/07/1916 II. E. 13. United Kingdom Second Lieutenant Machine Gun Corps (Infantry) 24/04/1917 Age: 25 X. C. 4. United Kingdom Private 26242 King's Shropshire Light Infantry 11/04/1917 Age: 33 VIII. B. 6. United Kingdom Sapper 6154 Royal Engineers 14/11/1916 Age: 36 IV. B. 5. United Kingdom Private 306447 Sherwood Foresters (Notts and Derby Regiment) 05/03/1917 Age: 24 V. C. 14. United Kingdom Private 25817 Leicestershire Regiment 16/04/1917 X. A. 2. United Kingdom Private 11122 King's Shropshire Light Infantry 10/04/1917 Age: 20 VII. A. 3. United Kingdom Rifleman 2477 Monmouthshire Regiment 30/12/1916 Age: 29 IV. F. 1. United Kingdom Private 5478 South Staffordshire Regiment 02/11/1916 IV. A. 7. United Kingdom Private 7998 Royal Berkshire Regiment 01/06/1918 Age: 31 XI. C. 16. United Kingdom Private 6945 London Regiment (London Scottish) 28/07/1916 Age: 24 I. J. 11. United Kingdom Private 251465 London Regiment (Royal Fusiliers) 11/04/1917 VIII. C. 7. United Kingdom Private 6137 York and Lancaster Regiment 17/11/1916 III. E. 2. United Kingdom Rifleman R/11947 King's Royal Rifle Corps 30/03/1917 V. F. 11. United Kingdom Corporal 12453 York and Lancaster Regiment 02/04/1917 VI. G. 7. United Kingdom Private 10369 Wiltshire Regiment 21/04/1917 Age: 24 IX. A. 5. United Kingdom Lance Corporal 511739 London Regiment (London Scottish) 11/04/1917 Age: 27 VII. D. 12. United Kingdom Private 267546 Northumberland Fusiliers 16/04/1917 Age: 27 VIII. H. 2. United Kingdom Private 200141 South Staffordshire Regiment 09/02/1917 Age: 22 IV. H. 13. United Kingdom Serjeant R/13223 King's Royal Rifle Corps 12/04/1917 Age: 24 VII. B. 15. United Kingdom Private 10056 South Staffordshire Regiment 11/10/1916 Age: 35 III. B. 9. United Kingdom Private 45920 West Yorkshire Regiment (Prince of Wales's Own) 27/03/1917 Age: 38 VI. E. 12. United Kingdom Private 4449 London Regiment (Royal Fusiliers) 25/06/1916 I. D. 6. United Kingdom Private 268897 The King's (Liverpool Regiment) 24/04/1917 IX. B. 7. United Kingdom Gunner 940704 Royal Field Artillery 06/04/1917 Age: 37 V. H. 14. 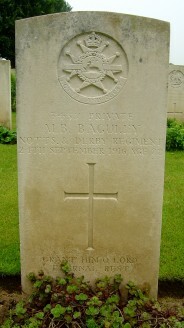 United Kingdom Private CMT/373 Army Service Corps 27/05/1918 Age: 26 XII. B. 12. United Kingdom Lance Corporal 49300 The King's (Liverpool Regiment) 23/04/1917 IX. B. 15. United Kingdom Private 3795 Cheshire Regiment 02/07/1916 II. D. 12. United Kingdom Gunner 206154 Tank Corps 24/04/1917 IX. A. 10. United Kingdom Corporal 550253 London Regiment (Queen's Westminster Rifles) 17/04/1917 Age: 25 X VII. J. 4. 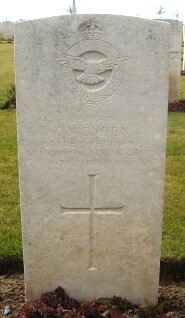 United Kingdom Gunner 651097 Royal Field Artillery 24/04/1917 Age: 20 IX. B. 10. United Kingdom Private 269890 Sherwood Foresters (Notts and Derby Regiment) 15/03/1917 V. D. 13. Canadian Captain Canadian Infantry (Alberta Regiment) 11/11/1917 Age: 21 XI. B. 8. United Kingdom Lance Corporal 2717 Lincolnshire Regiment 28/09/1916 Age: 22 II. G. 14. United Kingdom Private 4121 York and Lancaster Regiment 19/02/1917 Age: 18 V. B. 15. United Kingdom Second Lieutenant Monmouthshire Regiment 29/08/1916 Age: 27 III. A. 7. United Kingdom Private 14741 Middlesex Regiment 13/07/1916 XII. C. 5. United Kingdom Private 4919 King's Own Yorkshire Light Infantry 13/12/1916 IV. D. 12. United Kingdom Second Lieutenant Cameronians (Scottish Rifles) 24/04/1917 Age: 37 X. C. 3. United Kingdom Private 21618 The King's (Liverpool Regiment) 24/11/1916 III. G. 8. United Kingdom Private 30875 King's Own Yorkshire Light Infantry 21/11/1916 Age: 35 III. F. 1. United Kingdom Private 46144 The King's (Liverpool Regiment) 10/04/1917 VII. A. 14. United Kingdom Sapper 69977 Royal Engineers 20/10/1916 Age: 38 IV. A. 1. United Kingdom Private 56704 Devonshire Regiment 02/04/1917 Age: 41 V. G. 3. United Kingdom Acting Bombardier 102586 Royal Garrison Artillery 24/04/1917 Age: 31 X. C. 2. United Kingdom Private 3290 Leicestershire Regiment 30/06/1916 Age: 20 I. E. 9. United Kingdom Lance Corporal 16994 The King's (Liverpool Regiment) 15/04/1917 Age: 23 VIII. G. 1. United Kingdom Sapper 71105 Royal Engineers 31/10/1916 Age: 39 III. C. 11. United Kingdom Corporal 1365 Royal Field Artillery 08/01/1917 Age: 23 III. J. 6. United Kingdom Private 24648 The King's (Liverpool Regiment) 11/04/1917 Age: 21 VIII. B. 8. United Kingdom Sapper 558271 Royal Engineers 26/04/1917 Age: 20 X. D. 7. United Kingdom Private 203128 Leicestershire Regiment 13/03/1917 Age: 29 V. D. 10. United Kingdom Driver T4/062235 Army Service Corps 20/06/1916 I. D. 15. United Kingdom Private 40528 Royal Scots Fusiliers 24/04/1917 Age: 22 IX. B. 14. United Kingdom Private 53636 Machine Gun Corps (Infantry) 01/04/1917 VI. F. 11. United Kingdom Private 8625 Duke of Wellington's (West Riding Regiment) 20/01/1917 Age: 21 XII. C. 9. United Kingdom Captain Sherwood Foresters (Notts and Derby Regiment) 03/07/1916 Age: 23 I. F. 6. United Kingdom Private 33440 Yorkshire Regiment 26/11/1916 Age: 28 III. G. 7. United Kingdom Private 6373 Duke of Wellington's (West Riding Regiment) 31/01/1917 IV. G. 7. United Kingdom Private 26633 The King's (Liverpool Regiment) 26/04/1917 IX. E. 3. United Kingdom Private 5904 Northumberland Fusiliers 15/04/1917 VIII. G. 12. United Kingdom Rifleman S/13022 Rifle Brigade 05/05/1917 Age: 20 IX. G. 7. United Kingdom Private 472692 London Regiment (The Rangers) 14/04/1917 Age: 19 VIII. G. 3. United Kingdom Private 5663 Duke of Wellington's (West Riding Regiment) 15/01/1917 Age: 34 IV. E. 14. United Kingdom Serjeant 200092 Yorkshire Regiment 22/04/1917 Age: 22 IX. A. 2. United Kingdom Private 20151 King's Shropshire Light Infantry 12/04/1917 Age: 21 VIII. D. 6. United Kingdom Private 40776 Royal Scots Fusiliers 30/04/1917 Age: 30 X. E. 7. United Kingdom Private 20887 King's Shropshire Light Infantry 11/04/1917 Age: 19 VII. E. 13. United Kingdom Private 313865 York and Lancaster Regiment 02/04/1917 Age: 40 V. G. 15. United Kingdom Rifleman S/28317 Rifle Brigade 17/04/1917 Age: 40 X. A. 8. United Kingdom Private 21491 South Lancashire Regiment 19/02/1917 V. A. 1. United Kingdom Rifleman S/28167 Rifle Brigade 05/05/1917 Age: 20 IX. G. 5. United Kingdom Second Lieutenant Royal Berkshire Regiment 05/06/1918 Age: 27 XI. C. 12. United Kingdom Private 24126 Yorkshire Regiment 17/09/1916 III. A. 1. United Kingdom Gunner 756187 Royal Field Artillery 17/05/1917 Age: 21 XI. A. 6. United Kingdom Lance Corporal 19755 Yorkshire Regiment 13/11/1916 Age: 24 III. E. 12. United Kingdom Private 26879 Suffolk Regiment 19/11/1916 Age: 26 IV. B. 10. United Kingdom Lance Corporal 3132 Sherwood Foresters (Notts and Derby Regiment) 07/07/1916 Age: 25 I. G. 1. United Kingdom Private 5371 Leicestershire Regiment 09/08/1916 II. F. 2. United Kingdom Gunner 18326 Royal Field Artillery 16/11/1916 II. J. 13. United Kingdom Serjeant 50869 Royal Field Artillery 10/04/1917 VII. B. 9. United Kingdom Lance Corporal 17735 Bedfordshire Regiment 27/06/1916 Age: 27 I. D. 3. United Kingdom Driver 696030 Royal Field Artillery 22/04/1917 IX. A. 1. United Kingdom Second Lieutenant Manchester Regiment 25/04/1917 IX. A. 13. United Kingdom Second Lieutenant Royal Garrison Artillery 10/03/1917 Age: 23 VI. C. 12. United Kingdom Second Lieutenant Cheshire Regiment 03/04/1917 Age: 29 V. H. 9. United Kingdom Private 12366 King's Own (Royal Lancaster Regiment) 18/11/1916 Age: 33 III. F. 9. United Kingdom Gunner 26270 Royal Garrison Artillery 18/04/1917 Age: 27 VII. J. 6. United Kingdom Private 20714 Worcestershire Regiment 19/10/1916 II. J. 15. United Kingdom Private 36856 Manchester Regiment 06/12/1916 Age: 19 III. H. 13. United Kingdom Private 51667 The King's (Liverpool Regiment) 13/11/1916 Age: 19 III. E. 11. United Kingdom Private 253094 London Regiment (Royal Fusiliers) 05/04/1917 Age: 20 VI. H. 5. United Kingdom Private 3854 Sherwood Foresters (Notts and Derby Regiment) 14/01/1917 Age: 19 IV. E. 13. United Kingdom Private 4945 Sherwood Foresters (Notts and Derby Regiment) 08/07/1916 Age: 19 I. H. 13. United Kingdom Private 31329 Bedfordshire Regiment 11/04/1917 Age: 39 VIII. E. 4. United Kingdom Serjeant 390521 London Regiment (Queen Victoria's Rifles) 16/04/1917 Age: 26 VII. H. 8. United Kingdom Private 32824 King's Own Yorkshire Light Infantry 05/05/1918 Age: 23 XII. B. 3. United Kingdom Private 201787 Suffolk Regiment 23/04/1917 Age: 23 IX. B. 6. United Kingdom Private 5960 Duke of Wellington's (West Riding Regiment) 13/11/1916 III. D. 3. United Kingdom Private 6979 Duke of Wellington's (West Riding Regiment) 20/01/1917 III. J. 13. United Kingdom Private 328024 Sherwood Foresters (Notts and Derby Regiment) 17/02/1917 Age: 30 V. A. 8. United Kingdom Corporal 3831 West Yorkshire Regiment (Prince of Wales's Own) 06/12/1916 Age: 22 IV. D. 7. United Kingdom Private 26132 King's Own Yorkshire Light Infantry 11/04/1917 VIII. E. 8. United Kingdom Lance Serjeant 2413 Duke of Wellington's (West Riding Regiment) 18/02/1917 Age: 21 VI. A. 6. United Kingdom Private 33206 Wiltshire Regiment 14/04/1917 VII. F. 6. United Kingdom Private 17277 Dorsetshire Regiment 23/08/1916 Age: 19 III. A. 11. United Kingdom Private T4/126784 Army Service Corps 08/10/1916 Age: 38 II. H. 5. United Kingdom Private 242522 Leicestershire Regiment 05/03/1917 Age: 21 VI. B. 13. United Kingdom Private 492734 London Regiment 10/04/1917 Age: 32 VIII. A. 1. United Kingdom Second Lieutenant London Regiment (Cyclists) 17/04/1917 Age: 34 VII. J. 5. United Kingdom Private 242002 Border Regiment 26/04/1917 Age: 30 X. D. 8. United Kingdom Private 3171 Leicestershire Regiment 02/09/1916 II. G. 1. United Kingdom Private 33739 Machine Gun Corps (Infantry) 07/04/1917 V. J. 12. United Kingdom Private 513424 London Regiment (London Scottish) 09/04/1917 VIII. B. 2. United Kingdom Private 202596 North Staffordshire Regiment 25/02/1917 Age: 19 V. B. 9. United Kingdom Sapper 167850 Royal Engineers 20/01/1917 Age: 28 IV. F. 9. United Kingdom Serjeant 10952 Manchester Regiment 27/04/1917 Age: 23 IX. E. 9. United Kingdom Rifleman R/3484 King's Royal Rifle Corps 01/04/1917 Age: 22 V. G. 5. United Kingdom Private 37382 Durham Light Infantry 10/04/1917 Age: 35 VII. A. 1. United Kingdom Lance Corporal 2163 Lincolnshire Regiment 14/12/1916 III. H. 5. United Kingdom Serjeant 493913 London Regiment 11/04/1917 Age: 22 VIII. D. 13. United Kingdom Lance Corporal 305742 Sherwood Foresters (Notts and Derby Regiment) 17/02/1917 Age: 22 V. A. 4. United Kingdom Private G/13939 Royal Sussex Regiment 03/02/1917 Age: 37 IV. H. 5. United Kingdom Private 4589 Sherwood Foresters (Notts and Derby Regiment) 27/07/1916 Age: 22 I. J. 12. United Kingdom Second Lieutenant Middlesex Regiment 12/04/1917 Age: 34 VII. C. 12. United Kingdom Lance Corporal 17865 Middlesex Regiment 01/05/1917 Age: 28 X. G. 2. United Kingdom Driver 88242 Royal Horse Artillery 10/04/1917 VIII. F. 13. United Kingdom Private 6053 West Yorkshire Regiment (Prince of Wales's Own) 12/01/1917 IV. F. 7. United Kingdom Private 511532 London Regiment (London Scottish) 29/03/1917 Age: 23 VI. E. 14. United Kingdom Private 21375 Durham Light Infantry 11/04/1917 Age: 32 VI. J. 13. United Kingdom Private 5021 Sherwood Foresters (Notts and Derby Regiment) 26/06/1916 I. D. 7. United Kingdom Private 955 South Staffordshire Regiment 26/06/1916 I. D. 8. United Kingdom Rifleman 393394 London Regiment (Queen Victoria's Rifles) 15/04/1917 Age: 22 VIII. H. 6. United Kingdom Private 28810 Northumberland Fusiliers 15/04/1917 Age: 29 VII. H. 11. United Kingdom Private 32100 Durham Light Infantry 14/04/1917 VIII. G. 4. United Kingdom Lieutenant Lancashire Fusiliers 03/12/1916 Age: 22 III. G. 2. United Kingdom Flight Sub-Lieutenant Royal Naval Air Service 23/11/1917 Age: 18 XI. B. 10. United Kingdom Private 201154 Yorkshire Regiment 26/04/1917 IX. C. 1. United Kingdom Serjeant 15722 Manchester Regiment 29/04/1917 Age: 24 IX. F. 8. United Kingdom Serjeant 889 Lincolnshire Regiment 20/07/1916 I. H. 5. United Kingdom Private 200521 Sherwood Foresters (Notts and Derby Regiment) 04/03/1917 VI. B. 3. United Kingdom Serjeant 200805 South Staffordshire Regiment 08/02/1917 Age: 23 IV. E. 16. United Kingdom Private 12526 Royal Scots Fusiliers 01/05/1917 Age: 28 X. E. 11. United Kingdom Private 241807 South Staffordshire Regiment 15/02/1917 Age: 21 IV. J. 11. United Kingdom Private 241348 North Staffordshire Regiment 17/03/1917 Age: 38 V. E. 3. United Kingdom Private 3674 Middlesex Regiment 22/07/1916 Age: 26 IV. J. 16. United Kingdom Lance Corporal 200556 Cameronians (Scottish Rifles) 15/04/1917 Age: 24 VIII. H. 3. United Kingdom Serjeant 240047 Sherwood Foresters (Notts and Derby Regiment) 23/02/1917 Age: 46 V. B. 10. United Kingdom Private 39 Lincolnshire Regiment 01/04/1917 VI. F. 9. United Kingdom Private 220722 Royal Berkshire Regiment 01/06/1918 Age: 26 XI. C. 17. United Kingdom Private 20563 East Surrey Regiment 11/11/1916 III. D. 4. United Kingdom Private 20912 Royal Warwickshire Regiment 07/10/1916 Age: 26 II. H. 2. United Kingdom Driver 805410 Royal Field Artillery 14/03/1917 VI. D. 1. United Kingdom Private M2/166760 Army Service Corps 27/09/1916 Age: 24 II. G. 13. United Kingdom Private 19880 Somerset Light Infantry 10/04/1917 Age: 23 VII. A. 6. United Kingdom Lance Corporal 2102 Sherwood Foresters (Notts and Derby Regiment) 25/06/1916 XII. C. 1. United Kingdom Serjeant 13236 Royal Field Artillery 23/09/1916 III. B. 1. United Kingdom Private 17101 Royal Berkshire Regiment 15/11/1916 Age: 27 II. J. 12. United Kingdom Private 2934 Duke of Wellington's (West Riding Regiment) 23/01/1917 XI. C. 2. United Kingdom Private 1035 Royal Fusiliers 16/11/1916 Age: 28 III. E. 3. United Kingdom Private 16030 Machine Gun Corps (Infantry) 21/11/1916 III. F. 5. United Kingdom Private 51721 The King's (Liverpool Regiment) 28/04/1917 Age: 32 IX. D. 7. United Kingdom Private 252694 London Regiment (Royal Fusiliers) 05/03/1917 Age: 35 VI. B. 7. United Kingdom Private 4511 Sherwood Foresters (Notts and Derby Regiment) 21/09/1916 Age: 18 II. G. 9. United Kingdom Corporal 321093 London Regiment (City of London Rifles) 11/03/1917 Age: 29 V. D. 2. United Kingdom Rifleman R/14899 King's Royal Rifle Corps 11/04/1917 Age: 22 VII. B. 5. United Kingdom Gunner 35312 Royal Field Artillery 03/05/1917 Age: 20 X. F. 1. United Kingdom Private 202259 Yorkshire Regiment 24/04/1917 IX. A. 11. United Kingdom Rifleman 553174 London Regiment (Queen's Westminster Rifles) 17/04/1917 Age: 19 X. A. 1. United Kingdom Private 28667 Duke of Cornwall's Light Infantry 14/04/1917 VII. F. 15. United Kingdom Corporal 24617 Machine Gun Corps (Infantry) 19/02/1917 Age: 26 VI. A. 5. United Kingdom Private 6511 Duke of Wellington's (West Riding Regiment) 20/01/1917 Age: 22 XII. C. 10. 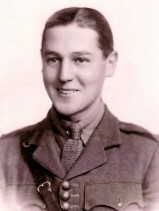 United Kingdom Captain Durham Light Infantry 10/04/1917 Age: 29 VIII. B. 1. United Kingdom Private 57384 The King's (Liverpool Regiment) 08/04/1917 Age: 29 VI. J. 1. United Kingdom Rifleman R/7705 King's Royal Rifle Corps 17/11/1916 Age: 25 III. F. 10. United Kingdom Private 15976 Suffolk Regiment 19/05/1917 Age: 21 XI. A. 10. United Kingdom Private 36934 Manchester Regiment 25/11/1916 Age: 20 IV. D. 3. United Kingdom Private 21900 Northumberland Fusiliers 03/04/1917 Age: 19 VI. G. 14. United Kingdom Second Lieutenant London Regiment (Royal Fusiliers) 02/07/1916 Age: 22 II. D. 1. United Kingdom Private 4538 Leicestershire Regiment 05/07/1916 Age: 25 I. G. 6. United Kingdom Rifleman 474131 London Regiment (The Rangers) 18/04/1917 X. A. 11. United Kingdom Rifleman R/21138 King's Royal Rifle Corps 26/01/1917 IV. G. 4. United Kingdom Pioneer 165903 Royal Engineers 31/03/1917 VI. F. 10. United Kingdom Private 46390 Northamptonshire Regiment 20/04/1917 X. B. 3. United Kingdom Acting Bombardier 79776 Royal Garrison Artillery 27/03/1917 Age: 29 V. F. 2. United Kingdom Private 20035 North Staffordshire Regiment 27/01/1917 IV. F. 13. United Kingdom Corporal 29622 Wiltshire Regiment 29/04/1917 Age: 24 IX. F. 4. United Kingdom Private 9358 Middlesex Regiment 24/07/1916 II. E. 11. United Kingdom Second Lieutenant Royal Flying Corps 24/03/1917 Age: 22 VI. E. 3. United Kingdom Private 36472 Lancashire Fusiliers 25/02/1917 Age: 24 V. B. 7. United Kingdom Private 2857 Sherwood Foresters (Notts and Derby Regiment) 06/07/1916 Age: 20 II. E. 5. United Kingdom Private 200614 South Staffordshire Regiment 18/03/1917 VI. D. 11. United Kingdom Private 7136 King's Own Yorkshire Light Infantry 05/11/1916 Age: 22 III. D. 10. United Kingdom Rifleman R/31242 King's Royal Rifle Corps 20/02/1917 Age: 30 VI. A. 8. United Kingdom Private 408 Royal Army Medical Corps 02/07/1916 Age: 25 II. D. 6. United Kingdom Private 250688 Durham Light Infantry 15/04/1917 VIII. G. 13. United Kingdom Private 33090 Leicestershire Regiment 13/04/1917 Age: 35 VIII. F. 3. United Kingdom Serjeant 10969 Cameronians (Scottish Rifles) 17/10/1916 II. H. 14. United Kingdom Private 38240 Yorkshire Regiment 25/04/1917 Age: 28 X. D. 3. United Kingdom Serjeant 7866 Royal Engineers 10/11/1916 Age: 34 II. J. 1. United Kingdom Lance Corporal 8956 South Staffordshire Regiment 14/11/1916 Age: 21 II. J. 6. United Kingdom Private 32766 Lincolnshire Regiment 12/04/1917 VII. B. 10. United Kingdom Rifleman 473343 London Regiment (The Rangers) 15/04/1917 Age: 28 VII. H. 10. United Kingdom Private 233209 London Regiment (Royal Fusiliers) 16/04/1917 Age: 24 VII. H. 4. United Kingdom Private 7149 King's Own Yorkshire Light Infantry 31/10/1916 Age: 29 III. C. 10. United Kingdom Sapper 58768 Royal Engineers 20/03/1917 Age: 24 VI. D. 14. United Kingdom Private 266813 Sherwood Foresters (Notts and Derby Regiment) 16/02/1917 Age: 23 V. A. 3. United Kingdom Private 21478 Northumberland Fusiliers 22/05/1917 XII. A. 8. United Kingdom Rifleman 3262 Monmouthshire Regiment 29/10/1916 III. C. 12. United Kingdom Private 16822 Dorsetshire Regiment 22/11/1916 Age: 31 III. F. 2. United Kingdom Private 17/245 Northumberland Fusiliers 03/04/1917 Age: 26 VI. C. 10. United Kingdom Lance Corporal 1037 Lincolnshire Regiment 03/02/1917 Age: 34 IV. G. 11. United Kingdom Private 36197 Yorkshire Regiment 03/04/1917 Age: 22 V. H. 7. United Kingdom Private 235192 Yorkshire Regiment 22/04/1917 Age: 28 IX. A. 4. United Kingdom Private 40532 Royal Scots Fusiliers 31/12/1916 IV. F. 2. United Kingdom Private 4279 North Staffordshire Regiment 27/08/1916 Age: 22 III. A. 8. United Kingdom Private 4/8764 Argyll and Sutherland Highlanders 19/04/1917 Age: 24 X. A. 13. United Kingdom Private 56662 Devonshire Regiment 06/04/1917 Age: 32 VI. H. 9. United Kingdom Gunner 135951 Royal Field Artillery 09/05/1917 IX. H. 9. United Kingdom Private 493663 London Regiment 10/04/1917 VIII. A. 13. United Kingdom Private 203684 London Regiment (Royal Fusiliers) 11/04/1917 VIII. A. 10. United Kingdom Lance Corporal 280645 London Regiment (Royal Fusiliers) 08/04/1917 Age: 25 VI. J. 2. United Kingdom Private 7212 Duke of Wellington's (West Riding Regiment) 03/02/1917 IV. G. 12. United Kingdom Private 4210 Duke of Wellington's (West Riding Regiment) 10/12/1916 Age: 22 III. H. 10. United Kingdom Corporal 240491 Middlesex Regiment 12/04/1917 Age: 22 VIII. C. 14. United Kingdom Private 4337 Leicestershire Regiment 06/07/1916 Age: 30 I. G. 3. United Kingdom Gunner 128506 Royal Field Artillery 09/11/1916 IV. B. 4. United Kingdom Private 20159 South Lancashire Regiment 19/12/1916 IV. E. 3. United Kingdom Second Lieutenant Royal Flying Corps 24/03/1917 V. F. 15. United Kingdom Serjeant 9871 Duke of Cornwall's Light Infantry 11/04/1917 Age: 23 VII. B. 2. United Kingdom Corporal 10722 Manchester Regiment 27/04/1917 Age: 37 IX. E. 7. United Kingdom Private 4733 North Staffordshire Regiment 03/10/1916 III. B. 3. United Kingdom Private 20891 Royal Warwickshire Regiment 13/10/1916 II. H. 9. United Kingdom Lance Corporal 23003 Wiltshire Regiment 12/04/1917 Age: 21 VII. F. 7. United Kingdom Gunner 95662 Royal Garrison Artillery 17/05/1917 Age: 37 XI. A. 12. United Kingdom Private 10996 Middlesex Regiment 14/12/1916 Age: 28 III. H. 9. United Kingdom Rifleman R/31494 King's Royal Rifle Corps 11/04/1917 Age: 22 VIII. E. 1. United Kingdom Private 5500 North Staffordshire Regiment 11/08/1916 Age: 19 II. F. 7. United Kingdom Driver 2694 Royal Field Artillery 16/12/1916 IV. E. 1. United Kingdom Serjeant 925171 Royal Field Artillery 09/03/1917 Age: 23 VI. C. 4. United Kingdom Rifleman 302135 London Regiment (London Rifle Brigade) 23/03/1917 Age: 24 V. E. 15. United Kingdom Private 858 Royal Fusiliers 04/07/1916 I. G. 8. United Kingdom Private 513254 London Regiment (London Scottish) 13/04/1917 Age: 21 VIII. D. 12. United Kingdom Private 40989 Cameronians (Scottish Rifles) 18/04/1917 Age: 31 X. A. 6. United Kingdom Rifleman 553666 London Regiment (Queen's Westminster Rifles) 08/04/1917 Age: 36 VI. J. 5. United Kingdom Private 5043 North Staffordshire Regiment 04/02/1917 Age: 20 IV. G. 13. United Kingdom Private 26615 Bedfordshire Regiment 24/12/1916 Age: 27 IV. E. 8. United Kingdom Driver M1/09066 Army Service Corps 06/03/1917 V. C. 8. United Kingdom Rifleman 3768 Monmouthshire Regiment 27/12/1916 Age: 28 IV. E. 9. United Kingdom Private 11178 Middlesex Regiment 14/12/1916 III. H. 4. United Kingdom Rifleman R/32323 King's Royal Rifle Corps 13/04/1917 Age: 29 VII. F. 5. United Kingdom Sapper 159094 Royal Engineers 22/04/1917 Age: 32 X. B. 11. United Kingdom Private 2614 South Staffordshire Regiment 24/06/1916 I. D. 9. United Kingdom Second Lieutenant (Pilot) Royal Flying Corps 01/07/1916 I. E. 8. United Kingdom Private 35378 Northumberland Fusiliers 06/04/1917 Age: 20 VI. H. 3. United Kingdom Sapper 3252 Royal Engineers 06/08/1916 IV. J. 15. United Kingdom Private 23262 Oxford and Bucks Light Infantry 02/04/1917 Age: 21 VI. G. 6. United Kingdom Captain London Regiment (Royal Fusiliers) 12/04/1917 Age: 25 VIII. D. 7. United Kingdom Private 20407 Bedfordshire Regiment 06/12/1916 IV. D. 9. United Kingdom Rifleman B/203127 Rifle Brigade 29/04/1917 IX. D. 10. United Kingdom Corporal 20752 Northumberland Fusiliers 04/04/1917 Age: 21 V. H. 3. United Kingdom Private 4604 Duke of Wellington's (West Riding Regiment) 07/11/1916 IV. A. 6. United Kingdom Gunner 4278 Royal Field Artillery 08/11/1916 Age: 20 III. D. 9. United Kingdom Gunner 2675 Royal Field Artillery 20/10/1916 Age: 24 III. C. 5. United Kingdom Serjeant 9433 Lincolnshire Regiment 15/04/1917 Age: 23 VIII. G. 11. United Kingdom Private 18695 Leicestershire Regiment 09/05/1917 Age: 29 IX. H. 13. United Kingdom Gunner 820978 Royal Field Artillery 10/03/1917 VI. C. 8. United Kingdom Private 42529 Royal Fusiliers 19/04/1917 Age: 27 VIII. J. 13. United Kingdom Private 231009 London Regiment (Royal Fusiliers) 13/04/1917 Age: 20 VII. F. 12. United Kingdom Private 2820 South Staffordshire Regiment 02/07/1916 Age: 24 I. E. 6. United Kingdom Private 1905 Lincolnshire Regiment 04/08/1916 Age: 21 I. J. 7. United Kingdom Lance Corporal 959 Royal Engineers 02/11/1916 Age: 21 IV. A. 9. United Kingdom Gunner 2901 Royal Field Artillery 13/10/1916 II. H. 8. United Kingdom Private 6255 16th (The Queen's) Lancers 17/04/1917 Age: 23 VIII. J. 7. United Kingdom Lance Corporal 29754 Middlesex Regiment 26/04/1917 Age: 28 IX. C. 12. United Kingdom Lance Corporal 13389 Bedfordshire Regiment 11/04/1917 Age: 24 VII. E. 4. United Kingdom Rifleman 323687 London Regiment (City of London Rifles) 05/03/1917 Age: 21 V. C. 12. United Kingdom Serjeant 4577 Lincolnshire Regiment 07/07/1916 Age: 21 I. G. 4. United Kingdom Private 25266 King's Own Yorkshire Light Infantry 05/05/1917 Age: 20 X. F. 6. United Kingdom Lance Corporal 12833 Durham Light Infantry 09/04/1917 VIII. B. 14. United Kingdom Private 36756 Lancashire Fusiliers 03/03/1917 Age: 30 VI. B. 2. United Kingdom Corporal 1515 Monmouthshire Regiment 14/10/1916 III. B. 13. United Kingdom Private 13327 Northumberland Fusiliers 02/09/1916 Age: 21 IV. H. 16. United Kingdom Private 203466 Sherwood Foresters (Notts and Derby Regiment) 19/02/1917 VI. A. 12. United Kingdom Private 22724 East Surrey Regiment 10/11/1916 Age: 34 III. D. 5. United Kingdom Private 325830 Durham Light Infantry 15/04/1917 Age: 29 VII. H. 12. United Kingdom Private 40592 Royal Scots Fusiliers 05/11/1916 Age: 38 IV. A. 13. United Kingdom Corporal 12445 Machine Gun Corps (Infantry) 27/04/1917 Age: 28 IX. E. 2. United Kingdom Gunner 110297 Royal Garrison Artillery 08/04/1917 Age: 34 VI. J. 6. United Kingdom Sapper 1456 Royal Engineers 02/07/1916 Age: 31 VI. E. 15. United Kingdom Driver TH/061944 Army Service Corps 16/03/1917 VI. D. 8. United Kingdom Private 202394 Cameronians (Scottish Rifles) 25/04/1917 Age: 20 IX. C. 8. United Kingdom Captain Royal Flying Corps 16/03/1917 V. E. 1. United Kingdom Second Lieutenant Royal Flying Corps 11/11/1917 Age: 26 XI. B. 9. United Kingdom Corporal 320867 London Regiment (City of London Rifles) 08/03/1917 Age: 23 VI. B. 14. United Kingdom Private 35099 Essex Regiment 07/05/1917 Age: 28 IX. H. 4. United Kingdom Lance Corporal 19078 Royal Berkshire Regiment 18/11/1916 Age: 30 III. F. 11. United Kingdom Lieutenant Sherwood Foresters (Notts and Derby Regiment) 02/07/1916 Age: 26 I. F. 14. United Kingdom Rifleman 394277 London Regiment (Queen Victoria's Rifles) 16/04/1917 VII. H. 13. United Kingdom Private 203286 South Staffordshire Regiment 16/03/1917 VI. D. 4. United Kingdom Private 203492 East Yorkshire Regiment 30/04/1917 Age: 24 X. E. 12. United Kingdom Rifleman R/28601 King's Royal Rifle Corps 01/02/1917 IV. C. 8. United Kingdom Corporal 1570 Sherwood Foresters (Notts and Derby Regiment) 05/02/1917 Age: 28 IV. H. 2. United Kingdom Lance Corporal 250449 London Regiment (Royal Fusiliers) 11/04/1917 Age: 26 VIII. A. 12. United Kingdom Private 2667 Cheshire Regiment 02/07/1916 Age: 17 II. D. 3. United Kingdom Private 240726 Cheshire Regiment 04/04/1917 Age: 22 V. H. 10. United Kingdom Private 19678 Wiltshire Regiment 11/04/1917 Age: 23 VIII. D. 8. United Kingdom Corporal 18107 Royal Garrison Artillery 22/10/1916 IV. A. 3. United Kingdom Private 6210 York and Lancaster Regiment 14/11/1916 Age: 20 II. J. 5. United Kingdom Private 39795 Lancashire Fusiliers 21/11/1916 Age: 25 III. F. 7. United Kingdom Private 202269 Yorkshire Regiment 25/04/1917 Age: 23 IX. E. 8. United Kingdom Lance Corporal 19267 Queen's Own (Royal West Kent Regiment) 05/05/1917 Age: 27 IX. G. 10. United Kingdom Lance Corporal 8952 Manchester Regiment 28/04/1917 IX. F. 13. United Kingdom Private 24777 Machine Gun Corps (Infantry) 02/12/1916 Age: 22 III. G. 1. United Kingdom Private 3497 Queen's Own (Royal West Kent Regiment) 06/05/1917 IX. H. 3. United Kingdom Second Lieutenant Royal Flying Corps 04/12/1917 Age: 26 XI. B. 11. United Kingdom Corporal 1682 Royal Warwickshire Regiment 14/10/1916 III. B. 14. United Kingdom Private 58402 The King's (Liverpool Regiment) 26/03/1917 Age: 30 VI. E. 10. United Kingdom Private 15601 Yorkshire Regiment 13/04/1917 Age: 23 VII. F. 3. United Kingdom Private 23100 Oxford and Bucks Light Infantry 10/04/1917 Age: 19 VIII. F. 12. United Kingdom Private 200461 Sherwood Foresters (Notts and Derby Regiment) 11/03/1917 Age: 32 V. D. 3. United Kingdom Rifleman 3890 Monmouthshire Regiment 09/08/1916 Age: 22 II. F. 1. United Kingdom Corporal 57677 The King's (Liverpool Regiment) 10/04/1917 VII. A. 9. United Kingdom Private 283748 London Regiment (Royal Fusiliers) 07/04/1917 Age: 33 V. J. 1. United Kingdom Corporal 16836 Border Regiment 09/10/1916 Age: 22 III. B. 7. United Kingdom Private 243945 Cheshire Regiment 11/04/1917 Age: 30 VIII. E. 3. United Kingdom Private 3513 Lincolnshire Regiment 13/07/1916 Age: 18 I. H. 12. United Kingdom Rifleman R/9938 King's Royal Rifle Corps 11/04/1917 VIII. F. 11. United Kingdom Captain King's Royal Rifle Corps 12/04/1917 Age: 27 VIII. F. 2. United Kingdom Private 35673 King's Own Yorkshire Light Infantry 20/04/1917 X. B. 2. United Kingdom Private 2643 London Regiment (Royal Fusiliers) 09/08/1916 Age: 19 I. J. 3. United Kingdom Rifleman S/17321 Rifle Brigade 10/02/1917 IV. J. 3. United Kingdom Private 22296 The King's (Liverpool Regiment) 29/12/1916 IV. E. 10. United Kingdom Rifleman 553367 London Regiment (Queen's Westminster Rifles) 13/04/1917 Age: 28 VII. D. 3. United Kingdom Second Lieutenant Duke of Wellington's (West Riding Regiment) 23/11/1916 IV. C. 11. United Kingdom Corporal 510746 London Regiment (London Scottish) 15/04/1917 Age: 25 VII. H. 7. United Kingdom Private 10960 Somerset Light Infantry 11/04/1917 VIII. E. 14. United Kingdom Private 52778 The King's (Liverpool Regiment) 20/11/1916 IV. B. 11. United Kingdom Private 512627 London Regiment (London Scottish) 29/03/1917 Age: 19 V. F. 10. United Kingdom Serjeant 13158 The King's (Liverpool Regiment) 06/04/1917 VI. H. 7. United Kingdom Rifleman 6142 West Yorkshire Regiment (Prince of Wales's Own) 08/10/1916 XI. C. 7. United Kingdom Corporal 3/9650 Yorkshire Regiment 04/04/1917 Age: 19 V. H. 1. United Kingdom Private 43758 Royal Army Medical Corps 07/07/1916 I. G. 5. United Kingdom Rifleman 303293 London Regiment (London Rifle Brigade) 28/03/1917 Age: 36 V. F. 1. United Kingdom Serjeant 2905 Royal Field Artillery 12/01/1917 III. J. 9. United Kingdom Lance Corporal 8015 Lincolnshire Regiment 12/04/1917 Age: 34 VIII. E. 2. United Kingdom Private CMT/363 Army Service Corps 27/05/1918 Age: 28 XII. B. 13. United Kingdom Private 16075 Highland Light Infantry 20/11/1916 Age: 22 IV. B. 14. United Kingdom Private 8348 Highland Light Infantry 16/11/1916 III. E. 8. United Kingdom Private 3856 Sherwood Foresters (Notts and Derby Regiment) 17/07/1916 Age: 26 I. H. 10. United Kingdom Private 30381 Yorkshire Regiment 20/11/1916 Age: 38 IV. B. 13. United Kingdom Driver 9628 Royal Field Artillery 21/12/1916 IV. E. 5. United Kingdom Private 302058 Durham Light Infantry 17/04/1917 Age: 39 VII. J. 2. United Kingdom Rifleman R/32331 King's Royal Rifle Corps 13/04/1917 VII. E. 7. United Kingdom Lance Corporal 1141 Sherwood Foresters (Notts and Derby Regiment) 31/01/1917 IV. G. 6. United Kingdom Private 14307 Bedfordshire Regiment 26/06/1916 Age: 22 I. D. 5. United Kingdom Private 3417 Middlesex Regiment 19/05/1917 Age: 35 XI. A. 9. United Kingdom Rifleman 323514 London Regiment (City of London Rifles) 12/03/1917 V. D. 5. United Kingdom Sapper 155157 Royal Engineers 14/12/1916 Age: 33 III. H. 8. United Kingdom Private 1633 London Regiment (Royal Fusiliers) 09/08/1916 Age: 20 II. F. 5. United Kingdom Private 10063 East Yorkshire Regiment 11/04/1917 VIII. E. 10. United Kingdom Pioneer 182465 Royal Engineers 10/03/1917 Age: 21 VI. C. 11. United Kingdom Rifleman 392831 London Regiment (Queen Victoria's Rifles) 18/04/1917 VII. J. 1. United Kingdom Private 4009 York and Lancaster Regiment 30/11/1916 Age: 19 IV. D. 5. United Kingdom Private 201742 Oxford and Bucks Light Infantry 06/05/1917 Age: 19 IX. G. 12. United Kingdom Private 240395 South Staffordshire Regiment 14/03/1917 Age: 28 VI. D. 2. United Kingdom Second Lieutenant Royal Flying Corps 02/04/1917 Age: 19 V. G. 7. United Kingdom Private 4544 West Yorkshire Regiment (Prince of Wales's Own) 29/11/1916 Age: 23 IV. D. 4. United Kingdom Serjeant 3397 Leicestershire Regiment 13/08/1916 Age: 25 II. F. 8. United Kingdom Private 36757 Lancashire Fusiliers 23/10/1916 Age: 27 III. C. 7. United Kingdom Private 514172 London Regiment (London Scottish) 10/04/1917 Age: 38 VII. A. 10.